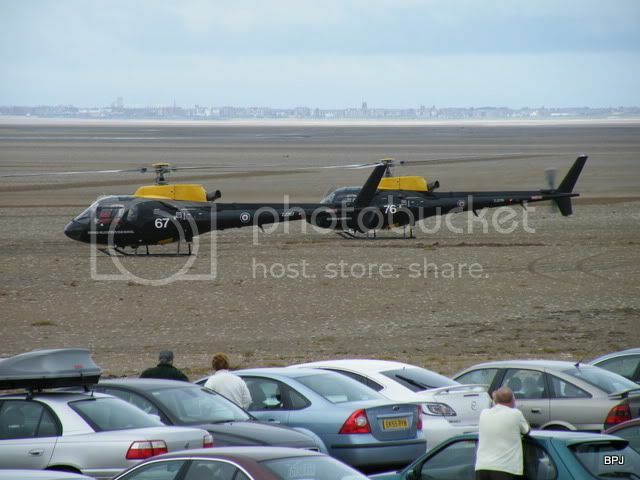 The highly successful ‘Southport Seafront Air Show’ took-over where the ‘Mersey Festival Air Display’ at either Otterspool or New Brighton left-off. 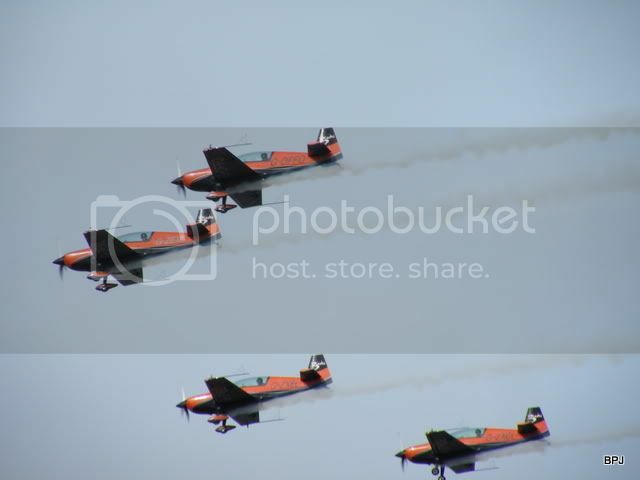 The first ‘Southport Air Show’ was in September 1991, initially as a one-day event, but quickly grew in 1995 to a two-day event. Only one year has been missed – in 1997-when major seafront defences reconstruction prevented access to the waterfront. Largely the September ‘slot’ in the calendar has been kept throughout the 20 years, although this has led to poor weather curtailing or cancelling the display on two occasions at least. While I have stood and shivered in an icy blast more frequently than watched the display in shirt-sleeves, the September event has worked well to draw visitors, in some large numbers, into Southport extending the summer season into September. Unlike many air displays with a regular ‘slot’, the weekend selected does change year to year due to the need to have an afternoon low tide. I don’t have logs full logs for all the Southport Air Show days, I’m sure that others will join in quickly to extend the knowledge and post pictures. 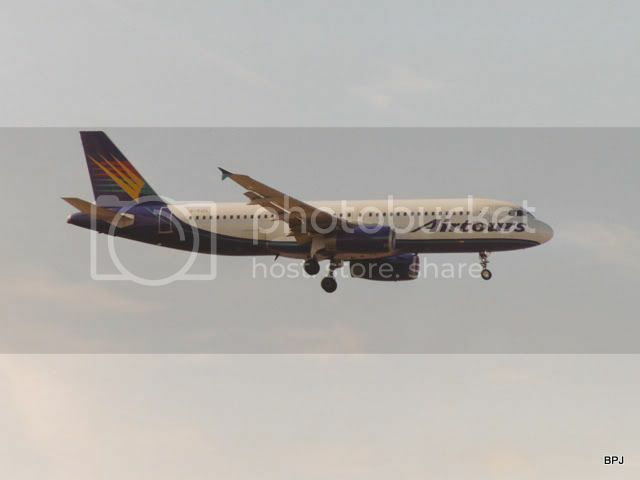 Most of the earlier reports come from ‘North West Air News’ magazine of the former Air Britain (Merseyside) Branch, with several relying heavily on Blackpool Airport movements report by the Blackpool Aviation Society, to whom due credit. The completeness and style of the reports does vary from year to year. After 1995, once the show became a two-day event, whilst the displays were similar, there would often be minor differences between the two days, the logs are normally for one day or the other though. It is interesting to note how aircraft types have come and gone over the years. 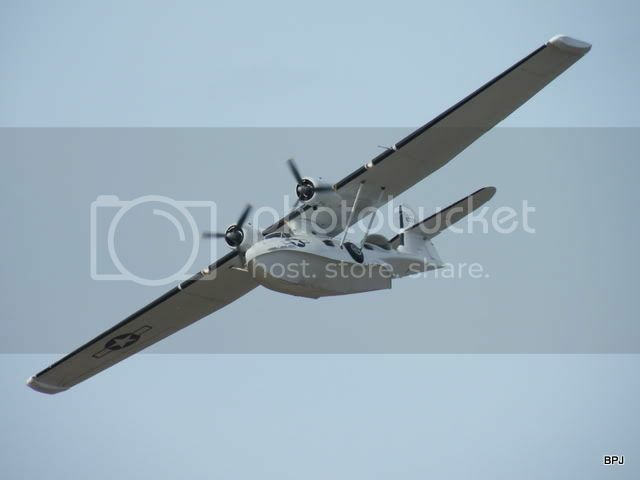 It is noticeable too, how the participants have gone from being mostly current military to mostly civilians with an increasing number of ‘warbirds’ displaying. 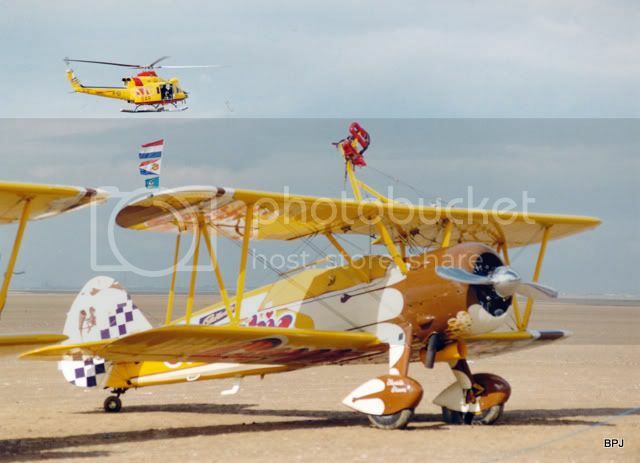 Several ‘constants’ through the twenty years have been the great crowd pleasers, the ‘Red Arrows’ aerobatic formation team, the ‘Battle of Britain Memorial Flight’, Stearman wing-walkers, the Navy Lynx team and Army helicopter team. 19th  2010  #9  Saturday 18th September, Sunday cancelled due forecast weather. Viscount .... Well that is just taking the biscuit! Regretably there was no commentary to fill out the bare details of this first show in the NWAN magazine report. 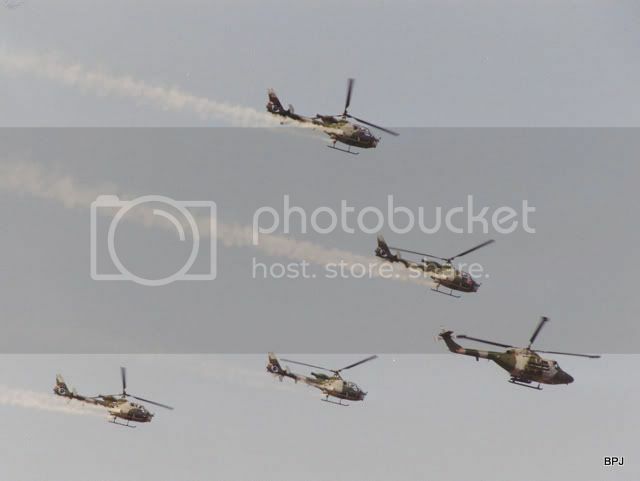 There was an Air Display at R.A.F. Woodvale the day before, many of the Southport participants being there too. No participants are included in the Liverpool or Blackpool visiting aircraft movement reports. 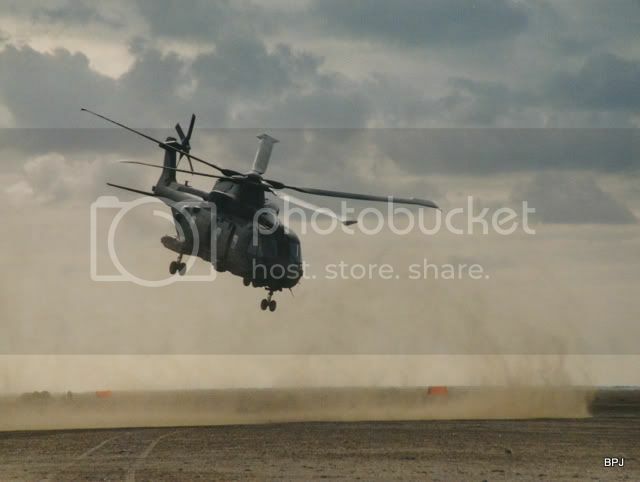 The Southport listing does not state if the helicopters landed on the beach or not. The Southport display was mostly military in participation; while the civilian Whirlwind probably was mundane at the time, now it would be considered quite exotic! Although ‘off topic’ for the thread, of interest may be RAF Woodvale, the day before! Report is from NWAN magazine. Again no commentary, but a list that looks to be fairly complete. Many of the military aircraft operated out of RAF Woodvale. 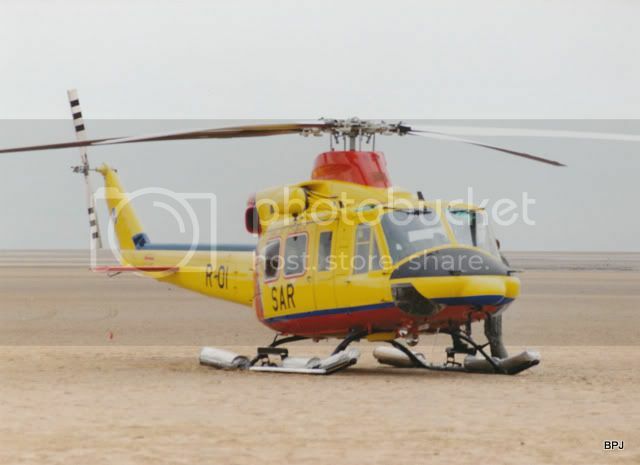 No indication of wether any of the helicopters landed on Southport Beach. Noteable for the first appearance of a civilian warbird, a Tornado F.3 and of the Dutch Air Force. From NWAN magazine comes a highly reliable report of the 1993 event, submitted by one Brian Jones! I also still have the programme for the event. Oddly the programme is dated for the Sunday only, yet according to a review of past Southport Air Shows in the 2002 programme, this was the first year that it was a two day event. It was certainly the first to feature a Harrier demonstration, a Buccaneer, Tornado GR.1 and a Stearman of the “Crunchie Flying Circus”. Spectator entrance was free, car parking on the beach £5 per car if paid in advance, programme £2. A number of aircraft operated from RAF Woodvale. Held on a cool, dry afternoon with a cover of medium height cloud. Fortunately the strong breeze was off-shore, making watching the show comfortable. Although rain was forecast, it held off until a few minutes after the final display item cleared the area! 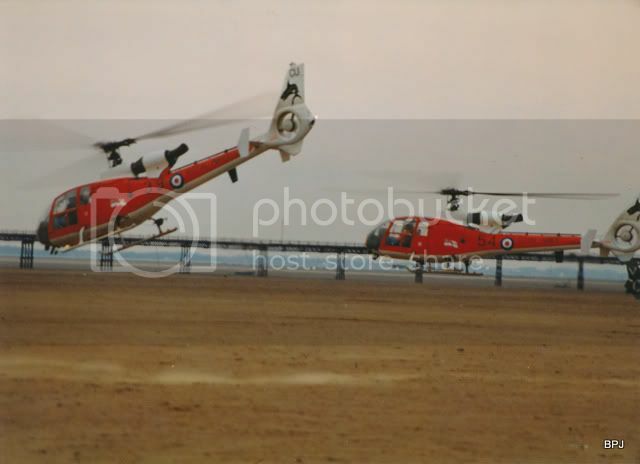 In addition to the pleasure flying Jet Ranger and Cessna 172; the Navy Gazelles and the Army “Silver Eagles” operated from the beach, while the “Red Arrows” commentator’s Gazelle used a site just inland from the Prom. 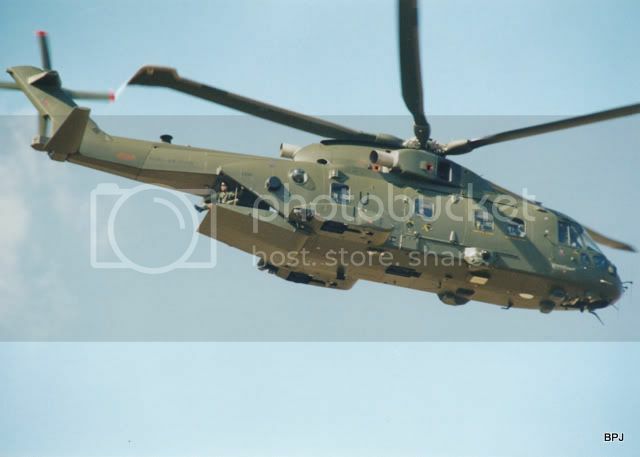 A very enjoyable show with a smooth flow of aircraft – the only ‘no show’ was a Sea King. Full marks to the organisers for a 3 hour ‘free’ flying display. XW870/F Gazelle HT.3 2 FTS, “Red Arrows” commentator, op. from behind Prom. Clearly back in the '90s with 'negative film' I chose my photos carefully to reduce costs, although my choice of subject is not alwasy logical. 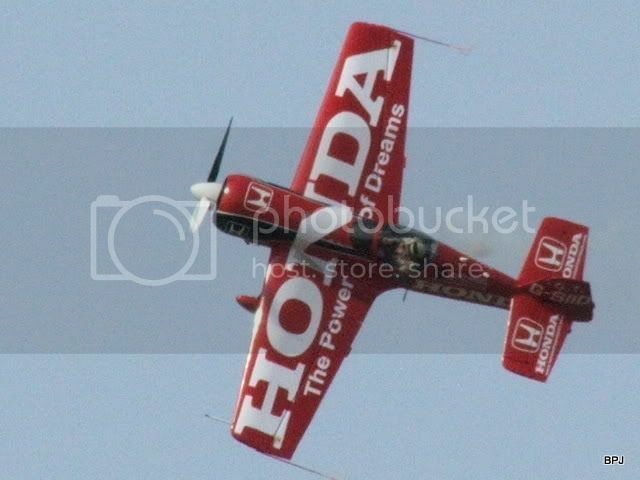 For the first 4 Southport Air Shows I attended I took less than a handful at each. 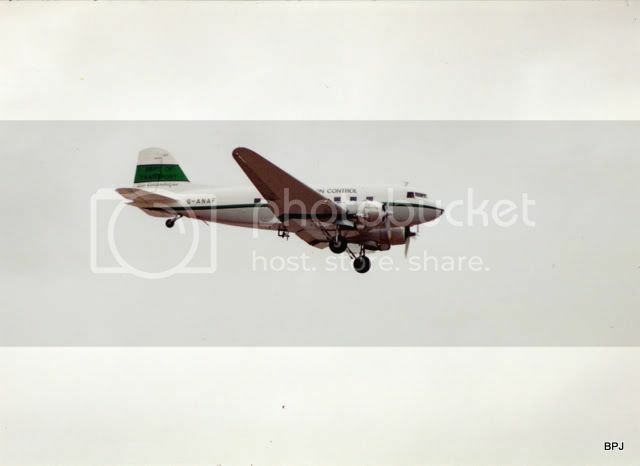 These are digitised from 7x5 prints, so are not of the best quality! 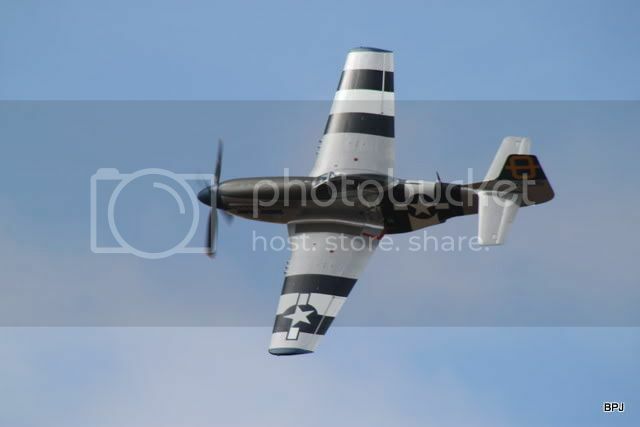 This free airshow was much larger than last year and was, once again, fortunate with the weather. Although a grey day with a cloud base of 3000ft and occasional light rain; the heavy rain and a 300ft cloud base held off until the airshow was virtually over. 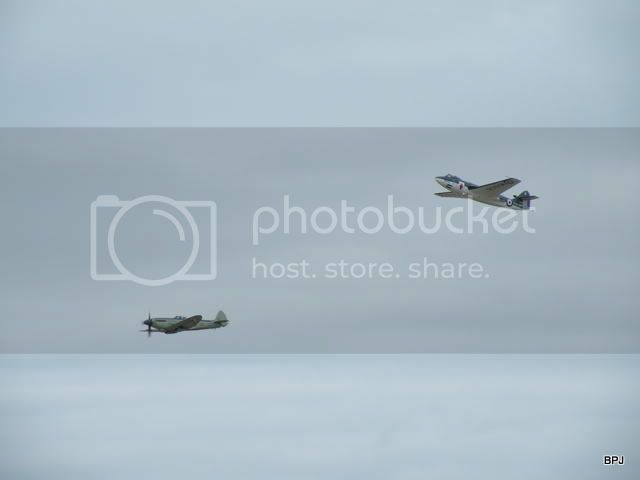 The show ran smoothly with no real gaps in the proceedings – the only ‘no show’ being the penultimate item – a Battle of Britain Memorial Flight Spitfire which turned back in the rapidly deteriorating weather. The rotary items all operated from the beach, many of the others from RAF Woodvale, with the “Red Arrows” using Blackpool. The air display lasted from 1230 to 1600 hours. Full marks to the organisers and, I for one, look forward to next year’s show. Plus a not identified Harrier GR.7 of 20(R)Sqdn. 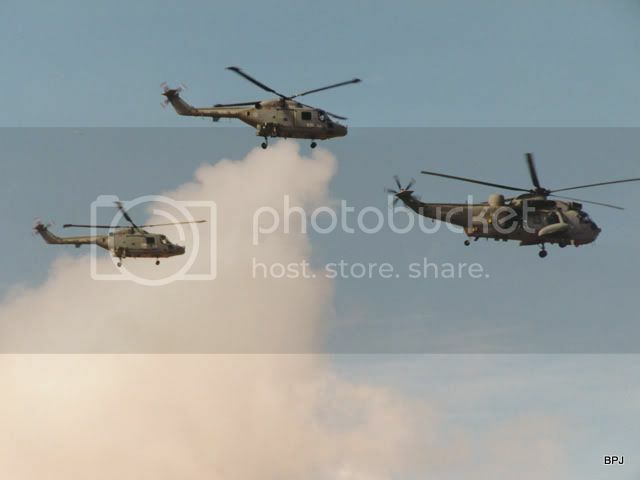 The military helicopters on the beach also used R.A.F. Woodvale. White cloud glare (coupled with mis-calculated meter readings) has seriously over-exposed these shots. I place them here as record, not as examples of my camera prowess! 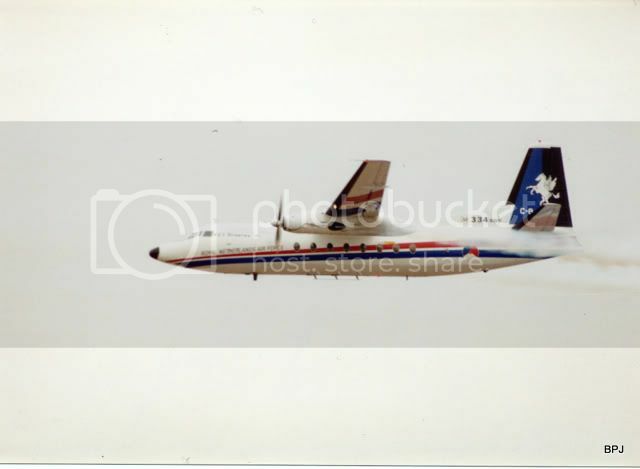 Special paint scheme on C-8, a Royal Netherlands Air Force Fokker 27 Troopship. The NWAN magazine report for 1995 was compiled by Carl Hope. This is the first time that I can be certain it was a two-day event. The log accounts for both days. It would appear that this was the first Southport Seafront display without the “Red Arrows”. Billed as the ‘biggest free air show in north’, this event was certainly better than many I’ve paid to go to. 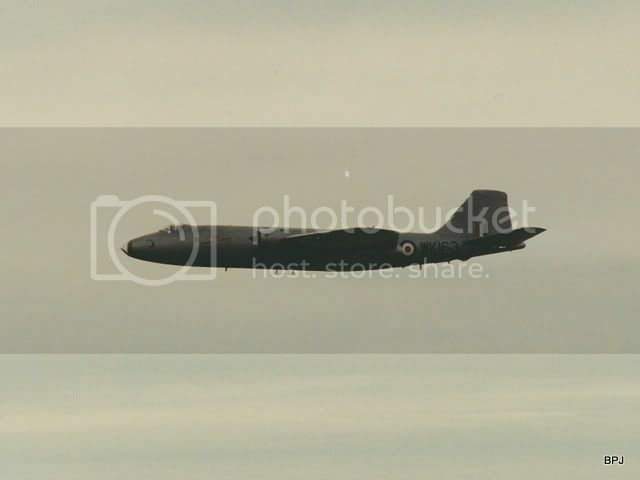 The F-27 put on a spirited display, but the ‘star turn’ was probably the Canberra which did an excellent low-level routine. 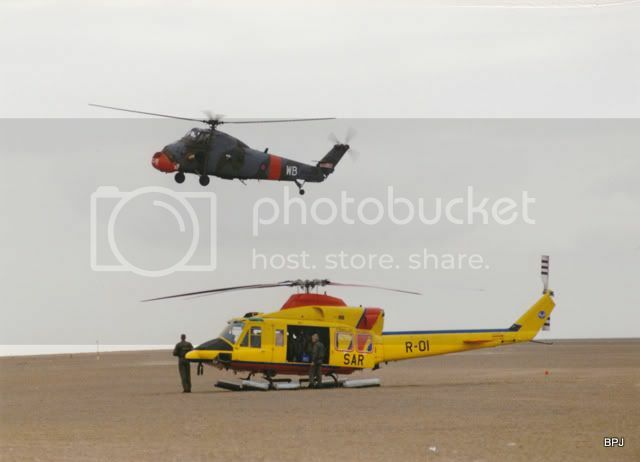 The helicopters arrived en-masse and operated from the beach, deploying to Woodvale overnight. The majority of other aircraft operated from RAF Woodvale. This report from NWAN magazine covers both the Saturday and Sunday of the two day FREE event. 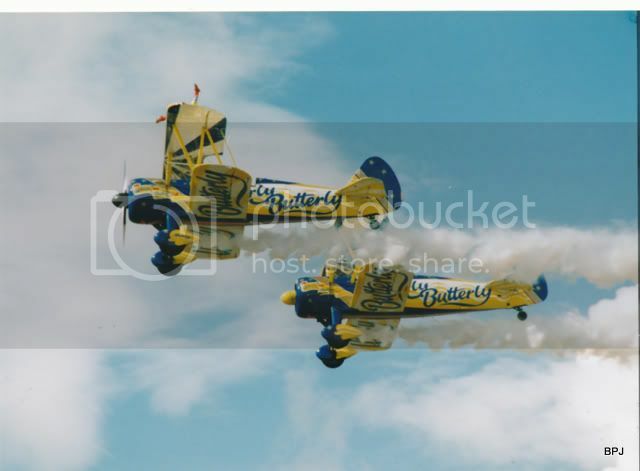 On the Saturday the Twin Pioneer failed to show, although it was present on the Sunday, while the “Utterly Butterly” An-2 failed to appear on either day, although it was expected. Car parking on the beach £5. This was the last year that fixed wing aircraft operated off the beach for over 10 years. ‘spare’ aircraft Tornado GR.1 ZA321/B-58 at Warton all weekend. Can find no mention of any aircraft using Blackpool, so presumably the helicopters, historics etc all used RAF Woodvale as is usual. Again suffering from over-exposure, but not quite so badly! No show possible in 1997 due to reconstruction of the sea wall defences and promenade at Southport. No introduction is provided for the log in NWAN magazine. From other sources I find that Southport enjoyed ‘Mediterranean’ weather for the ’98 show. Largest ever (so far) attendance figures, with over 270,000 visitors over the two days. 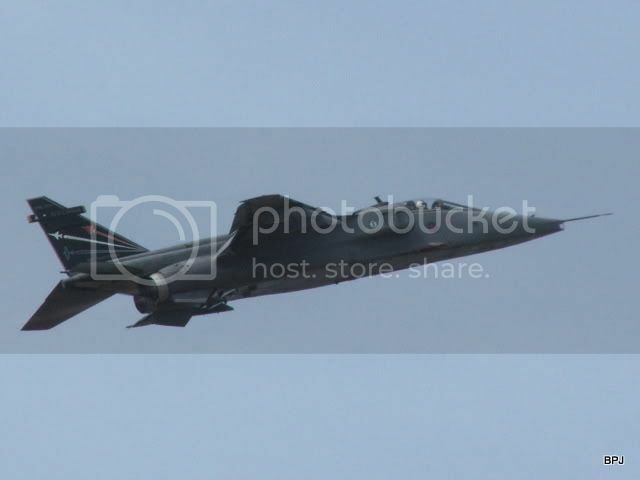 Southport was the only ’98 airshow to feature the brand new Eurofighter, they claim. 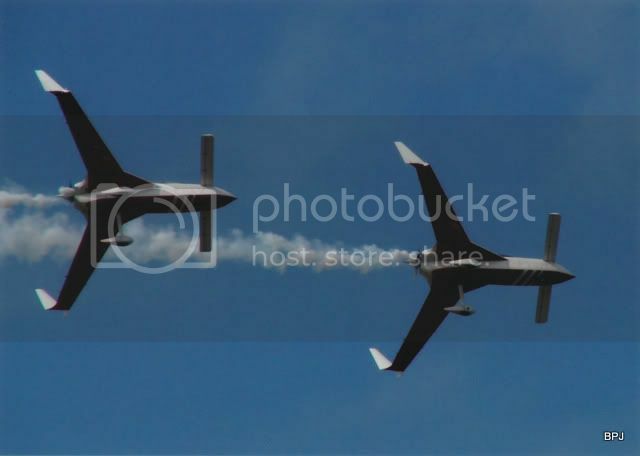 Indeed local company British Aerospace participated for the first time, also featuring their Pilatus PC-9, and were presumably behind the appearance of the Swedish Air Force Gripen too. This log is for the SATURDAY 29th AUGUST ONLY. ‘Spare’ aircraft, Bulldog XX686/4 at Woodvale all weekend. 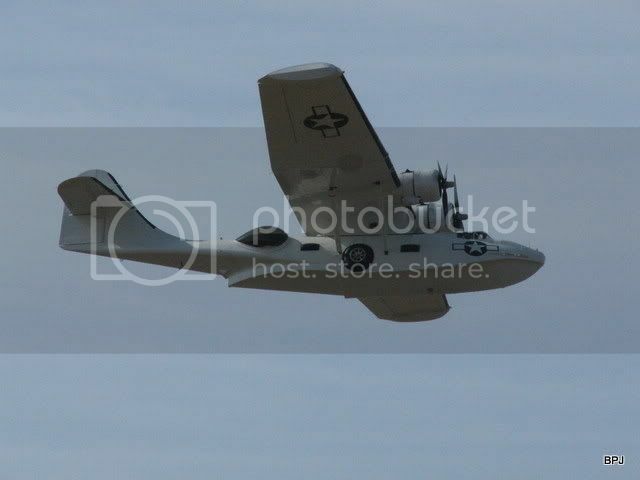 Both Bulldogs and the An-2 flew from Woodvale to Liverpool Airport Sunday evening. 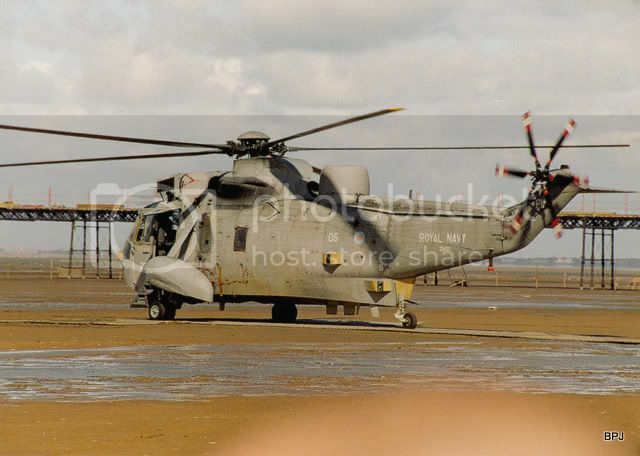 Majority of aircraft overnighted at Blackpool eg “Blue Eagles”, “Crunchie”, the BBMF, Sea King, Bell 412, ZF418 Tucano T.1 (possibly a Sunday only participant). 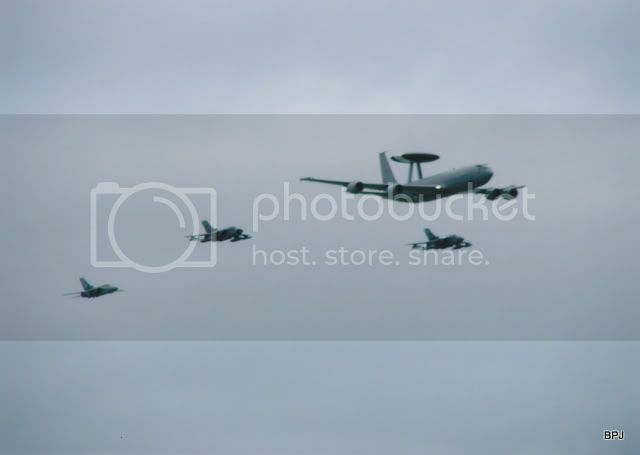 Warton had a large ‘Families’ Day display on Friday 28th August. 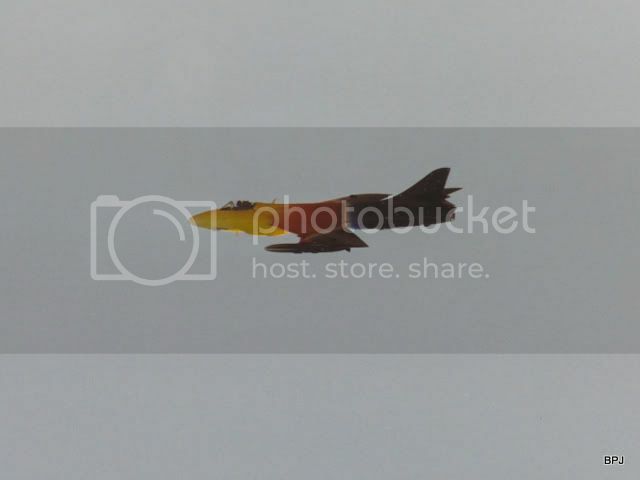 Majority of the Southport participants were there, including the “Red Arrows”,” Crunchie” pair, “Microlease” Extra, Canberra, Hunter, 2 x Harriers, RN Sea King and 2 x TTTE Tornado (ZA355/B-54 being the ‘spare’) and Swedish Gripen. WEEKEND 4th & 5th SEPTEMBER, 1999. The Canberra operated from Liverpool Airport, the only aircraft participating to do so. No clues in the movements lists for where the participants overnighted, although most used Blackpool, while the BBMF used Hawarden. I have the programme for 1999. Although participating in a totally different sequence, the line-up for the two days was broadly similar. Differences are on the Saturday only, a Boeing 757 of Airtours, the Tornado F.3, the Harvard and the BBMF. While on the Sunday only, Spitfire PT462/SW:A. 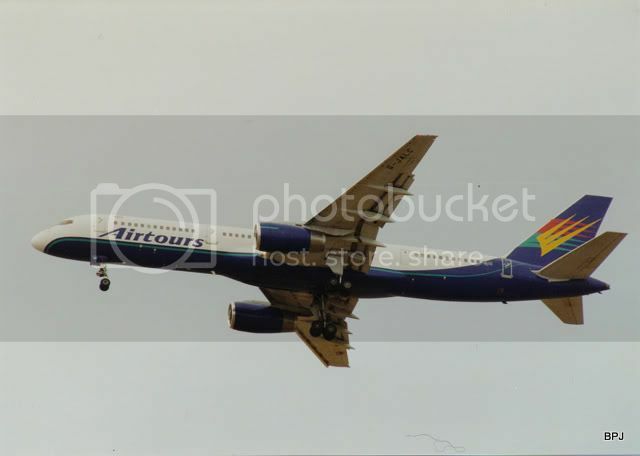 ‘No shows’ on the Saturday were an Airtours International Boeing 757 and a Hawker Hunter. Slight improvement in the quality of shots in 1999, although the original prints look better. WEEKEND of 9th & 10th SEPTEMBER. What a contrast. After two consecutive years of glorious weather, 2000 was the wettest so far, with rain a problem on the Sunday. 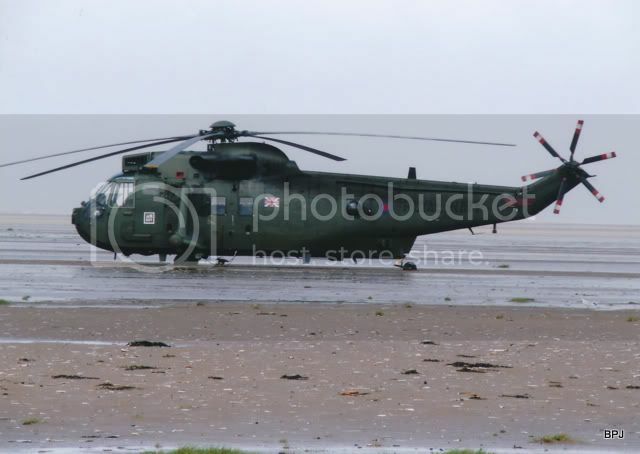 Conditions on the beach could be described as ‘soft’, so on the Sunday, even the Sea King started to sink into the sand! 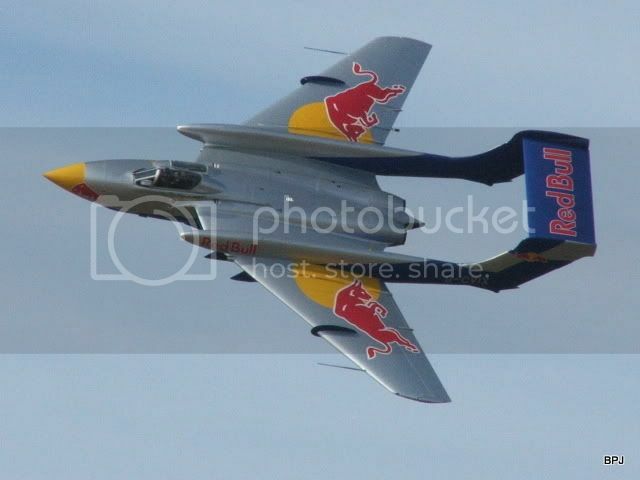 I was there on the Saturday, when highlights, without doubt, were the Boeing 757 being thrown around the sky and a rare British appearance by the Swedish single seat Vampire. The log here is for SATURDAY 9th taken from NWAN magazine with details added from my own log of events. 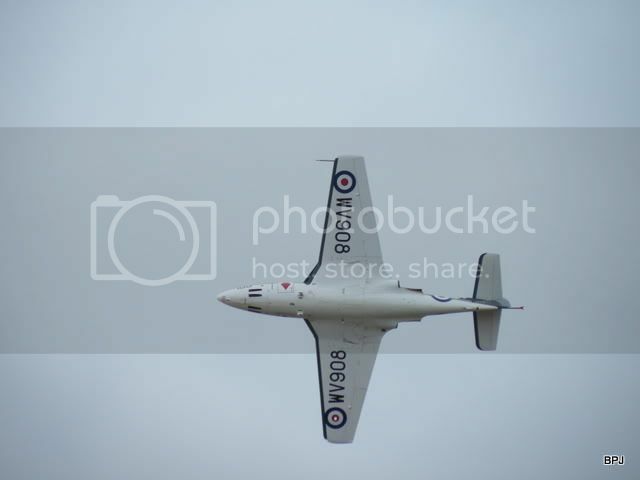 ‘No shows’ on the Saturday were a Tucano, Sea Fury and a Chinook. Also a ‘plastic’ mock-up of an air ambulance Bo.105 for fund raising, with ‘G-BAFD’ on a cardboard instrument panel! 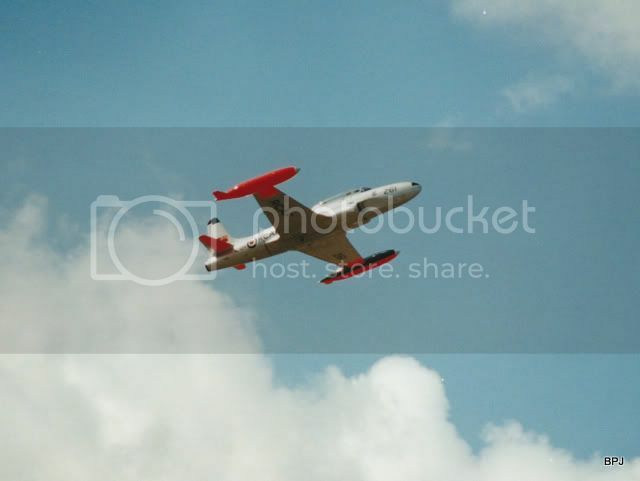 WK163 (G-BVWC) Canberra B.6 (mod) Classic Jet Avn. 9 x “Red Arrows” perm from: XX233, 237, 253, 260, 264, 292, 306, 307, 308, 156, 227. 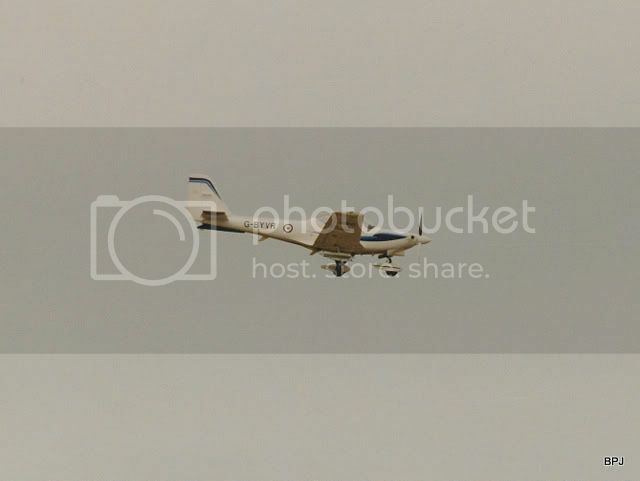 All 11 overflew Southport 1720 hours, Saturday. 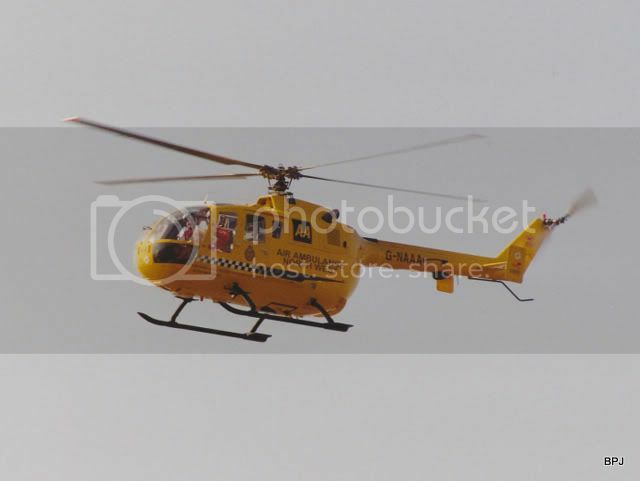 A Police Twin Squirrel (presumed G-BOOV) noted flying well inland of the display line out of Woodvale. The Broussard, Canberra, Pitts, Stearmen, Yak 50, Extra, Vampire, Mustang, Corsair, Dakota, Hunter, Harrier, “Red Arrows”, Tornado F.3 (with ‘spare’ ZE889) and Tornado GR.1 (with ‘spare’ ZA321) all operated from Blackpool Airport. 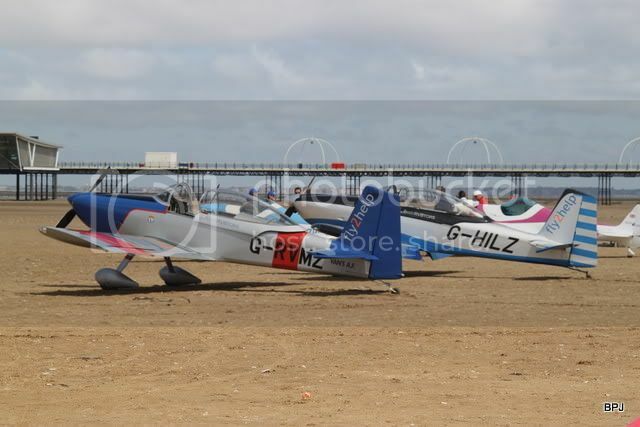 Also at Blackpool on 9th were further Yak-50s G-BWJT, G-BWYK, RA01294, RA02246, RA01493, LY-ANG and LY-ASG, which could well have been in connection with the Sunday at Southport Air Show. 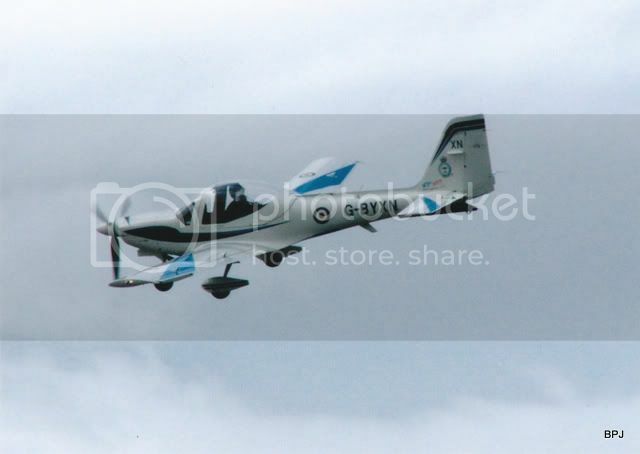 The Grob used RAF Woodvale overnight. WEEKEND of 8th & 9th SEPTEMBER. XV184/184(?) 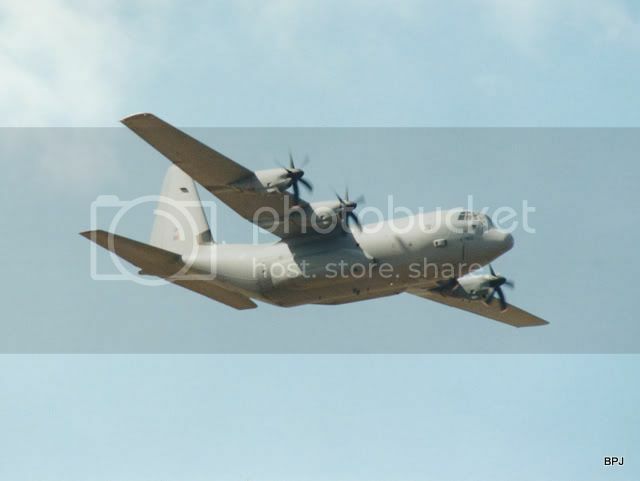 Hercules C.3 from Teesside with TA for mass para-drop, canx due winds. 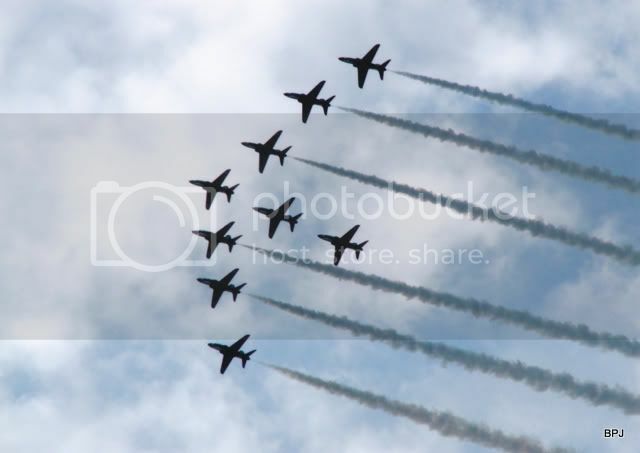 Plus the “Red Arrows” who closed the show at 5pm, with 9 a/c drawn from: XX156, 227, 233, 237, 253, 292, 294, 306, 307, 308 & 349. 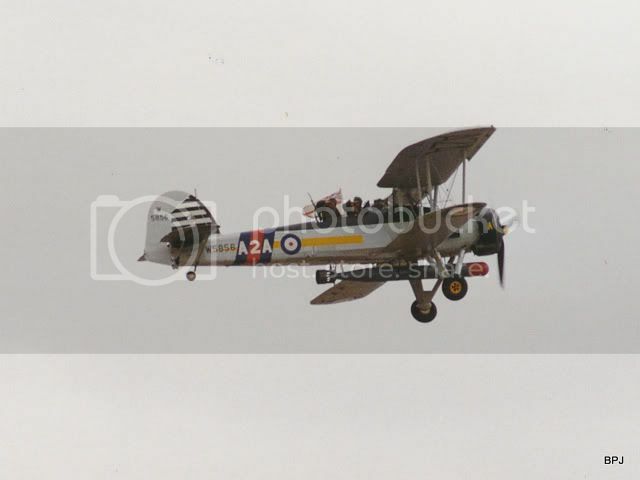 All the above bar the static Gazelle, Police Squirrel, the BBMF and the Hercules night-stopped and operated from Blackpool – including the Nimrod. 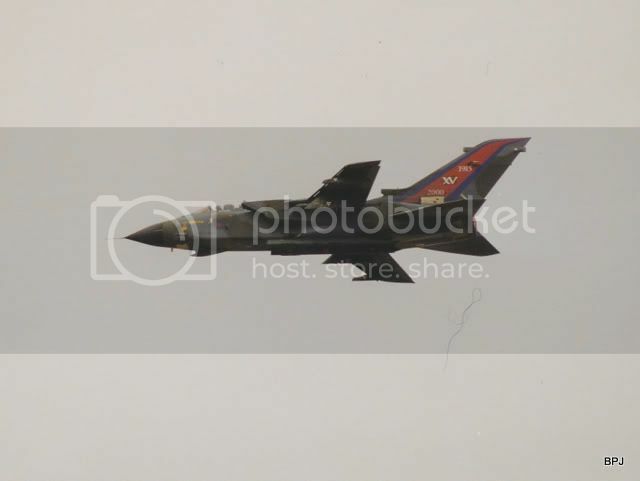 Also at Blackpool were ‘spare’ aircraft ZG478 Harrier GR.7 and one of the Hawks listed above. 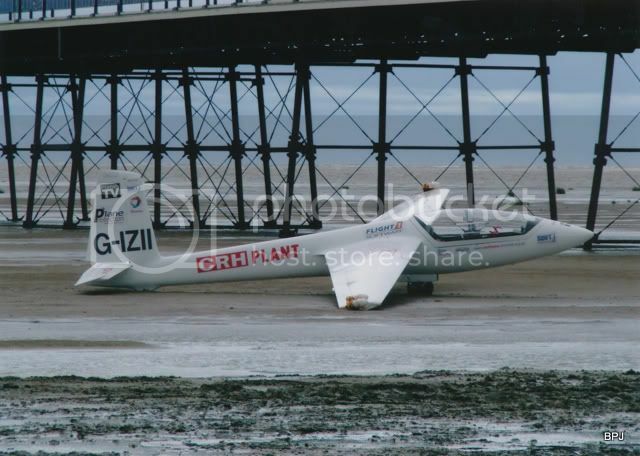 Also at Blackpool that weekend were Grob G.115E G-BYXA and Super Stearman N707TJ & N5057V, but neither were logged by myself displaying at Southport Saturday. 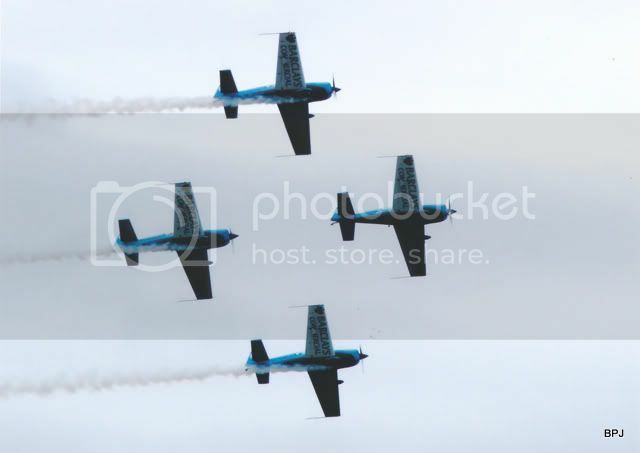 Also at Blackpool to display on the Sunday were the “Aerostars” team with Yak-50s: LY-ANG, LY-ASG, LY-IOO, RA-01293, RA-01493, RA-02246, one of which would be a ‘spare’. 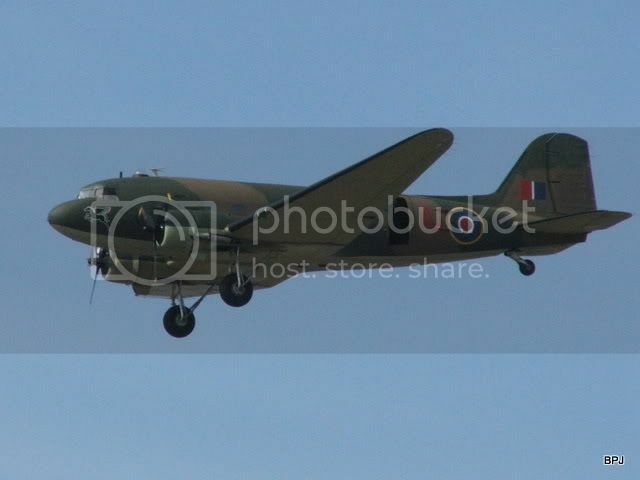 Also at Blackpool was Air Atlantique Dakota G-AMRA, possibly just a co-incidence? WEEKEND of 31st AUGUST & 1st SEPTEMBER. 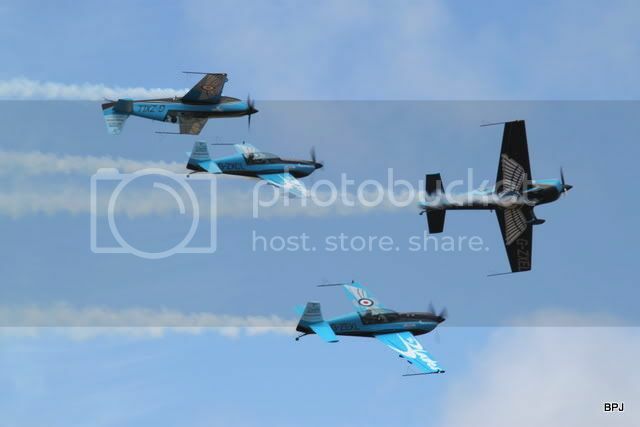 Notable for a rare British air display appearance by the Khalifa Jet Team with their 4 x L-39 Albatros aircraft. 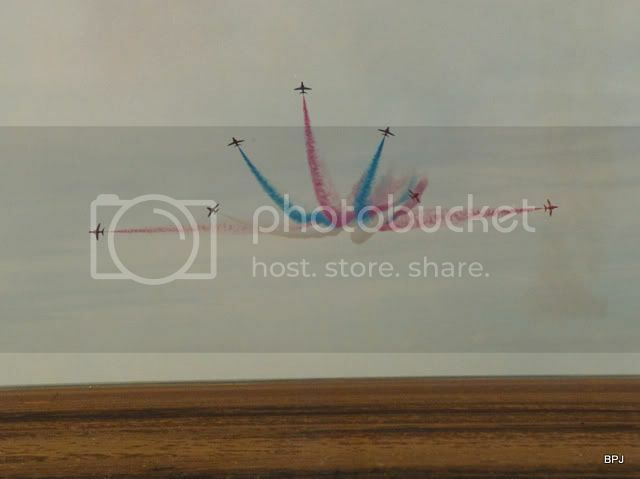 They made up for the lack, in 2002, of the “Red Arrows”. 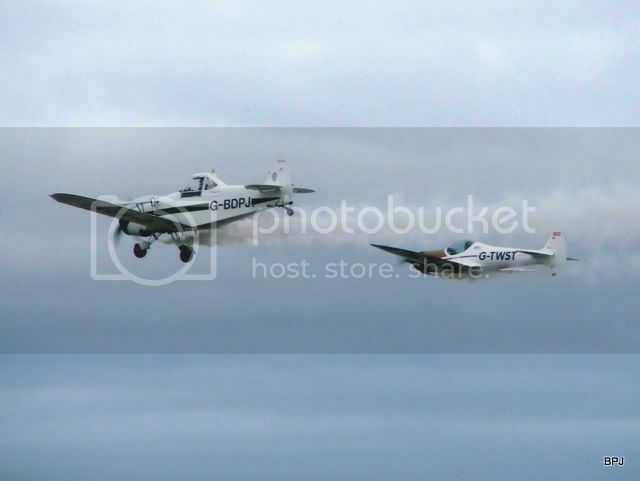 I also caught up with watching the “Aerostars” operating 6 x Yak-50s for the first time. 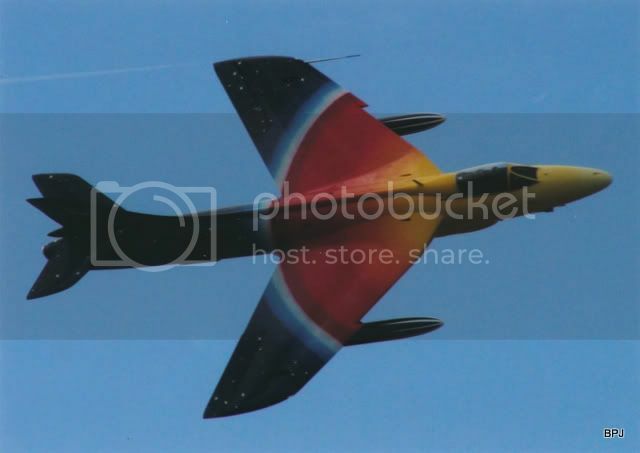 New on the British air display ‘circuit’ was the mighty Sea Vixen, which certainly impressed. 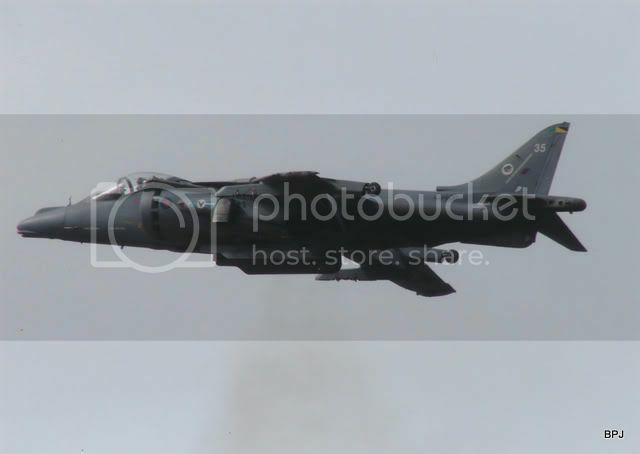 Possibly unique at an air show, the demonstration of 4 Harriers together, nicknamed ‘Fours Four’ certainly ended the show on both days with plenty of noise – a stunning and unforgettable demonstration in collaboration with Army units on the ground! Again no fixed wing aircraft operated from the beach. I have the souvenir programme (£3) for 2002, differences between the two days being the mass drop by 4 Para (Sat only), although the ‘Falcons’ were due both days; SAR Sea King (Sun only); ‘no shows’ were a Corsair (probably same one as previous year) and the Tornado GR.4, while an ‘extra’ was the T-33A . This report, a combination of my own notes and Blackpool Airport movements, is for SATURDAY 31st, when the afternoon started off bright and sunny, but deteriorated to rain shortly after the flying had ended. 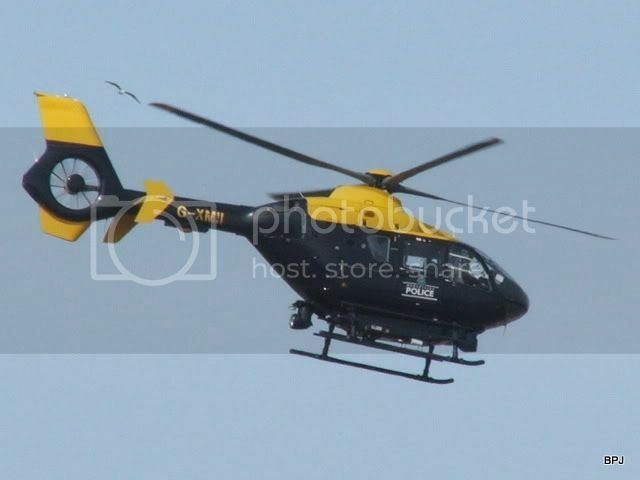 All operated from Blackpool with the exception of the microlight (by road) and Police EC.135 (lives at Woodvale). 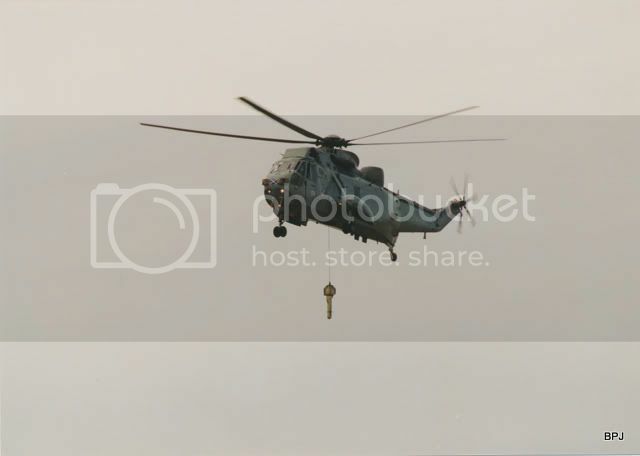 At least one Navy Lynx also used Woodvale. Also at Blackpool was the ‘spare’ Hawk, Tucano ZF139, and Harriers ZD435/47 and ZG506/77 (I think I have the 4 participating correct). Pitts G-SIIC and Dragon Rapide G-AIDL were both at Blackpool during the weekend, could be co-incidence as neither featured in the display programme. Some confusion as the registrations and codes on the six Yak-50s. 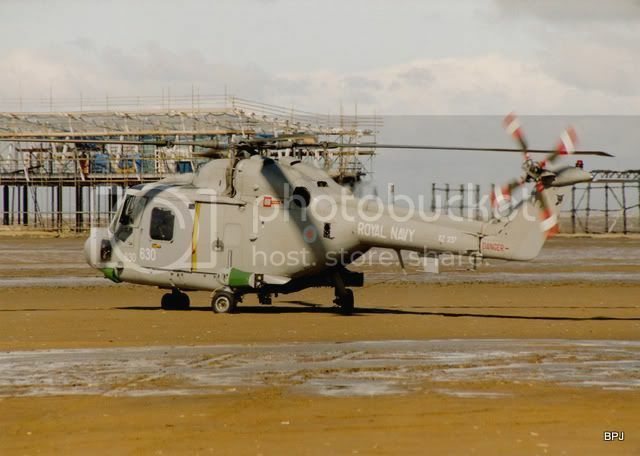 RA-01493 also quoted, error – or was there a ‘spare’ at Blackpool, if so which one? WEEKEND of 6th & 7th SEPTEMBER. This report is from my notes made on the day, plus Blackpool movements, coupled with the souvenir programme (£3). Weather on the Saturday was cool, but fine with sunny intervals, but rather soggy wet underfoot on the beach. 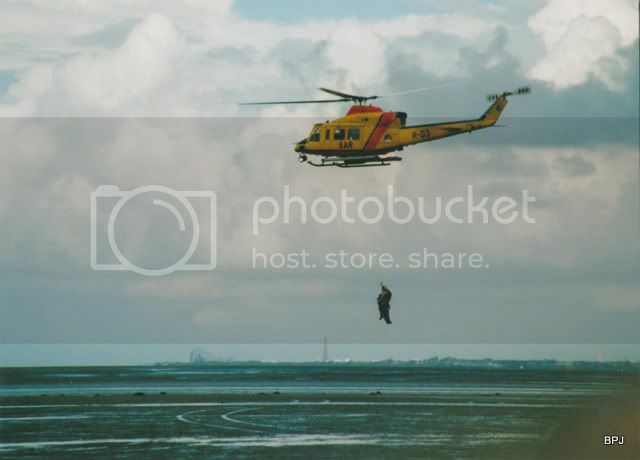 Good to see participation by the Dutch SAR Unit again, previously appeared in 1996 & 1998. Somewhat unusual in that all the items on the programme turned-up, with the two-seat Spitfire being an addition! The four-ship Harrier routine once again impressed, building up with the Army Lynx and Chinook into a good role demonstration. This log is for the SATURDAY. ZH876/876 Hercules C.4 30 Sqdn crew, with the ‘Falcons’ free-fall team. 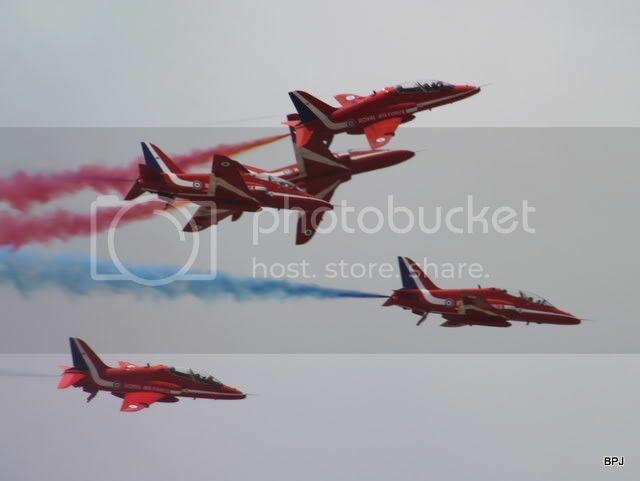 Also 9 x “Red Arrows” Hawk T.1 drawn from: XX179, 227, 260, 264, 266, 292, 294, 306, 307 & 308. The majority of participants used Blackpool as a base. The ‘spare’ Harrier, Red Arrows Hawk and XX253 Valley Hawk were all at Blackpool. The two seat Spitfire & Canberra operated from elsewhere, while the 2 Navy Lynx presumably used Woodvale. The Hercules C.4 used Liverpool Airport, after the ‘Falcons’ drop on the Saturday went ‘tech’ so missed the end of show drop of 4 Para. On the Sunday performed both drops at Southport. 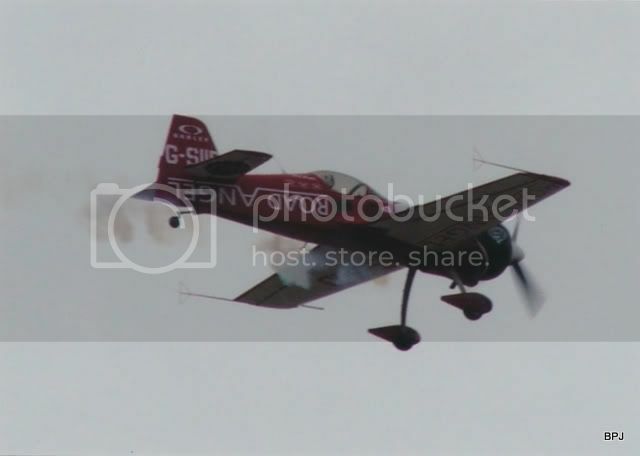 Also at Blackpool for the weekend was Pitts S-2C G-SIIC, but certainly did not perform at Southport on Saturday, nor mentioned in the programme. WEEKEND of 11th & 12th SEPTEMBER. No Air Show log was published in NWAN magazine, nor did I attend in 2004. This therefore is a list of probable participants and ‘spares’ that used Blackpool Airport during the weekend. 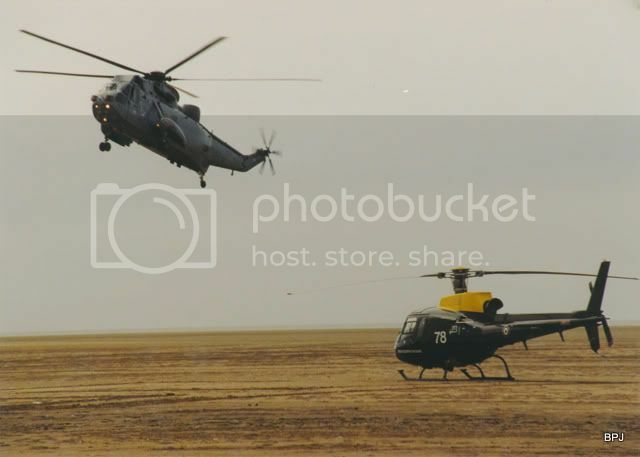 The Dutch Bell 412 participated again, the 4 Harriers performed for the third successive year a routine not seen at any other British Air Show. 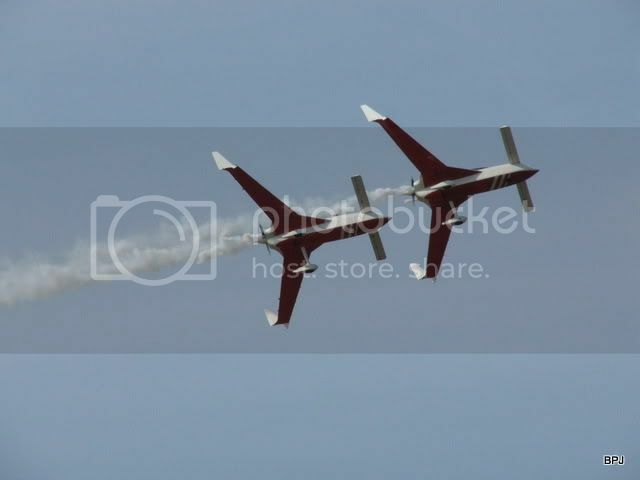 The “Red Arrows” though appeared on the Sunday only. Additional comment can be found on post #15, pointing out that 2004 was a very weather affacted weekend, with the display affected on both days. It is very likely that a few other aircraft participated, maybe the BBMF, RNHF, civilian ‘warbirds’ etc that did not call at Blackpool. 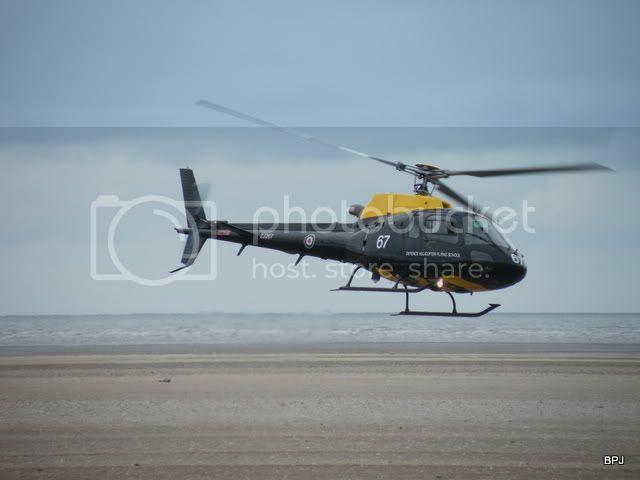 Air Ambulance Bo.105DB G-WAAN called at Blackpool on Saturday, probably not connected with Southport though. 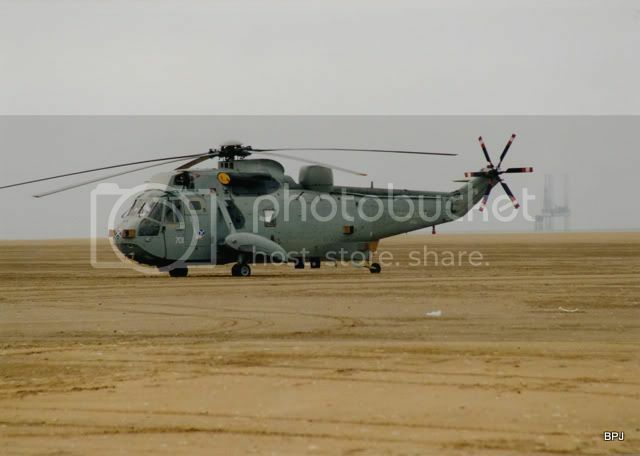 Neither have I any clue as to which aircraft were statically displayed on/by the beach, or which helicopters operated from the beach. So, does anyone have a good log of events in 2004 to help improve this account? WEKEND of 10th & 11th SEPTEMBER. By now, no longer a ‘free’ air show (anyone know the year when pedestrians were first charged? ), with many of the recruitment stands in the ‘Army Village’ on Princes Park , inland of the prom. In advance a pedestrian £4, while on the day £6. Car parking on Princes Park £18 in advance, £22 on the day (on the beach parking £25), including occupants. 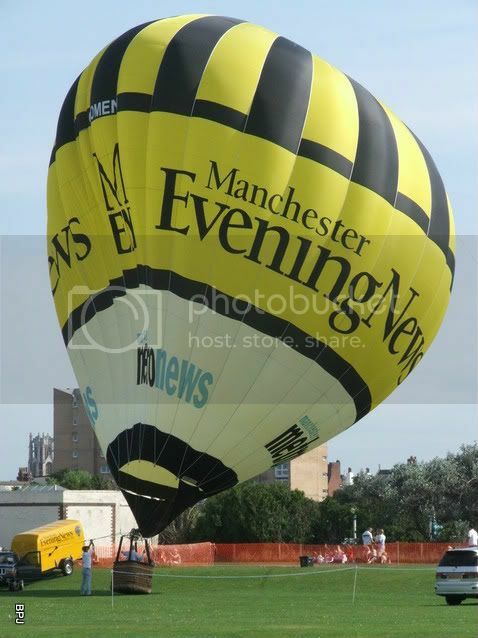 G-OMEN HAB “Manchester Evening News” tethered inflation in am, Princes Park. 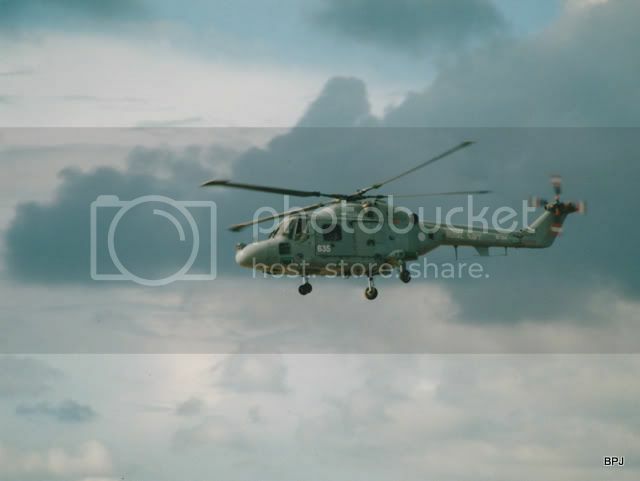 ZF123/WW Sea King HC.4 RN, 848 NAS. It would appear that all the flying display participants visited/night stopped at Blackpool Airport. 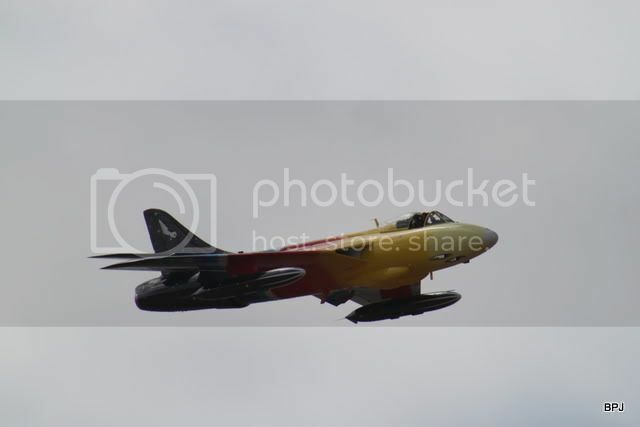 The only one that didn’t was the Saturday only Sea Fury VR930 (provided it displayed). ‘Spares’ on the ground at Blackpool were XX201 Hawk T.1A, XX306 ‘Red Arrrows’ spare Hawk, ZD251/636 Lynx “Black Cats”, ZA459/F Tornado GR.4 (although both Tornados flew on the Saturday, this was the ‘spare’ on Sunday), XZ103/FP Jaguar GR.3A. 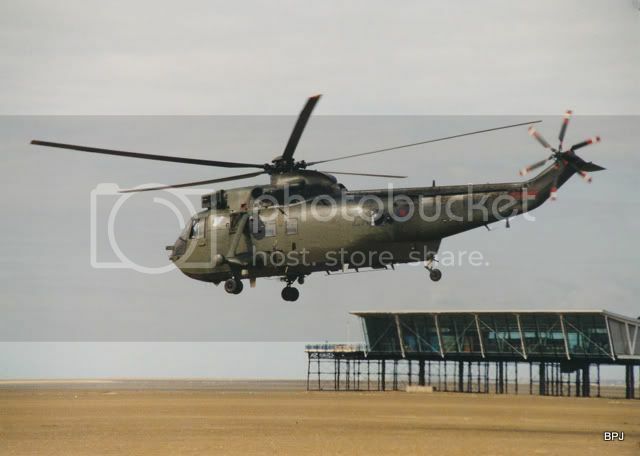 RAF Rescue Sea King XZ598 visited Blackpool Airport on the Saturday, it may or may not have been a Southport participant, likewise Pitts S-2B G-SIIE was at Blackpool for the weekend, but was not on the programme and certainly did not display on the Sunday. 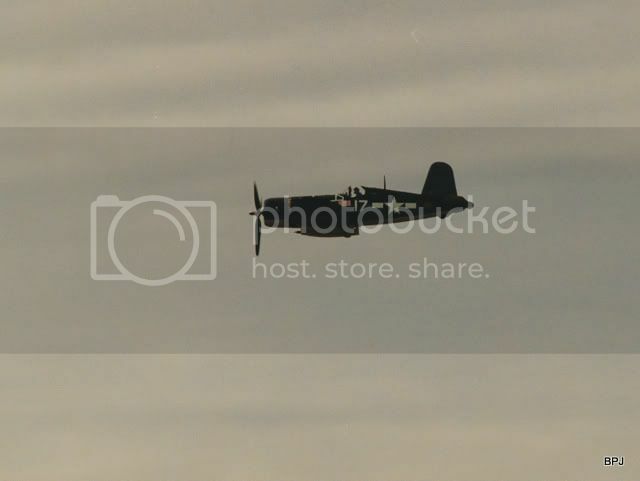 My log is confusing as to whether the BBMF Lancaster appeared on the Sunday or not. It certainly did not land at Blackpool, although the Dakota, Spitfire and Hurricane did. 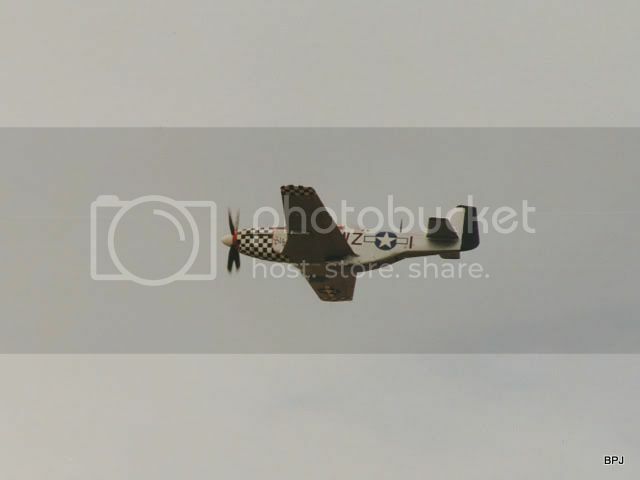 The photos here are some of the first air display photos I took using a Fuji compact, with a x 12 optical lens. Unlike all earlier and a few later years, these are digital images, not scanned prints. WEEKEND of 2nd & 3rd SEPTEMBER. I was there in 2006, but took only a few photos, did not buy a programme and cannot locate my log notes for the event! The NWAN magazine finished mid 2006, while my record of the participants was lost on the shut-down of the NWAN xsorbit bulletin board. However, thanks to the great help of John Wiseman and the Blackpool Aviation Society, I can trace a great number of the participants over the two days. 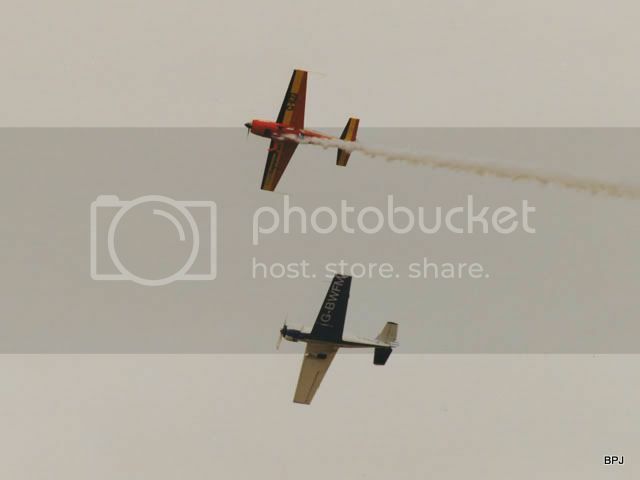 On the Saturday the weather was very poor and the flying display curtailed. I was there on the Sunday and certainly the sand was waterlogged and very wet; although the afternoon started dull, it ended bright and sunny with an on-shore breeze. 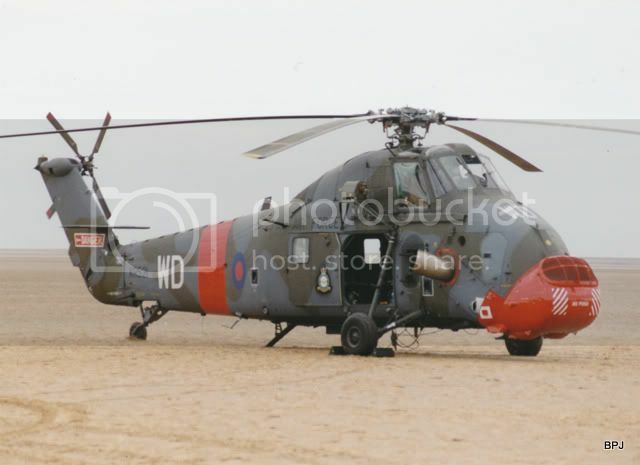 The Sea King on the beach sank upto its axles and the stall holders and exhibition stands had great problems extricating themselves at the end of day. I was there with the FoLA/Liverpool Airport stand and conditions were dreadful. 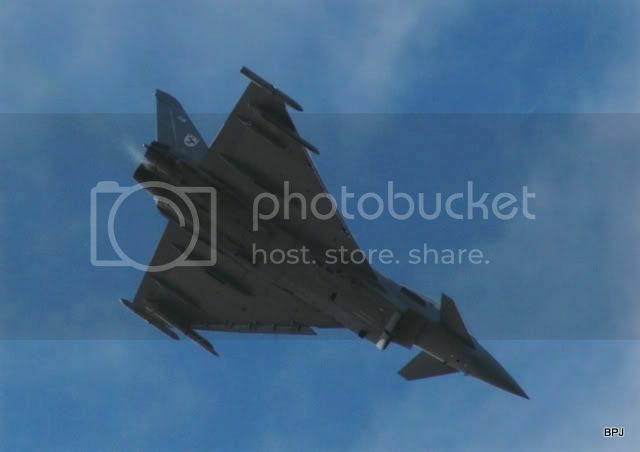 With decreased RAF participation, not the most impressive of Southport Air Shows, although it was the first to feature an operational Typhoon (previous one was a BAe flight-test Eurofighter 2000 in 1998). 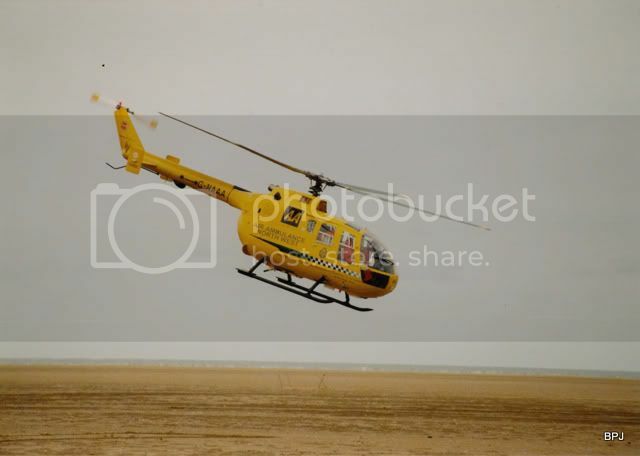 Participants on the Saturday included, flying out of Blackpool Airport: the Navy Sea King, Pitts G-SIIE, XX159 Hawk solo, the ‘Reva’ team and ‘Blades’ teams, along with communications Squirrel ZJ276. 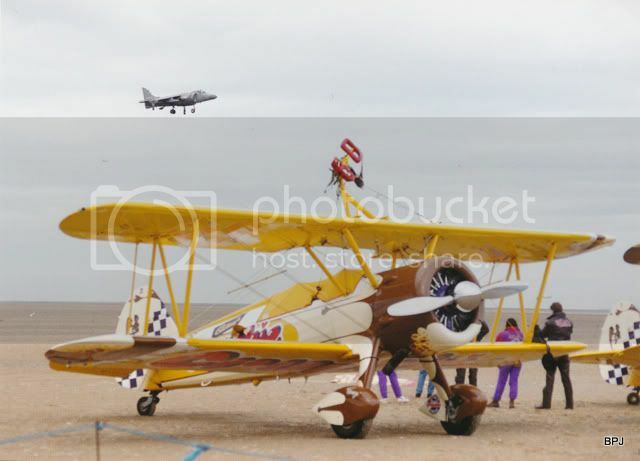 The 4 x ‘Wingwalker’ Stearman, 3 x ‘Yak’ team (G-YAKM arrived Sunday), Lynx pair of the ‘Blackcats’, ‘Red Arrows’ team, Hunter, Mustang, Harrier, Nanchang and the Su-26 appear to have all stayed on the ground at Blackpool. The Sea Vixen did not arrive until Sunday. 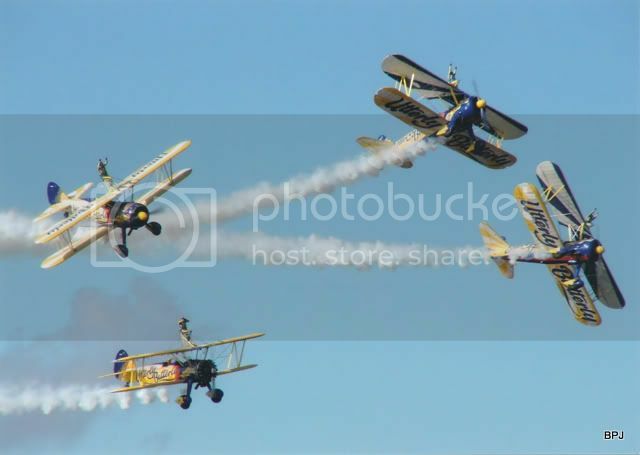 N707TJ, N5057V, N54922, N74189 4 x Stearman of the “Utterly Butterly” wing-walking team together! 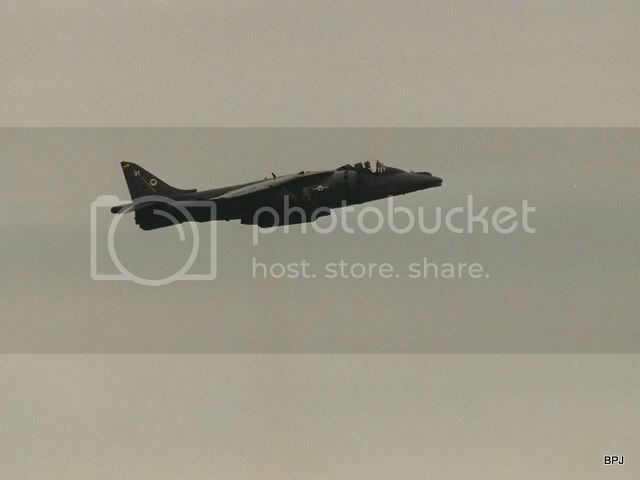 ‘Spare’ aircraft on the ground at Blackpool Airport all weekend were: XX217 RAF Valley Hawk, ZD467/ Harrier. Puma XW209 called at Blackpool Friday and Monday, but I think co-incidence. Of the ‘Red Arrows’ one of the spares was XX294. 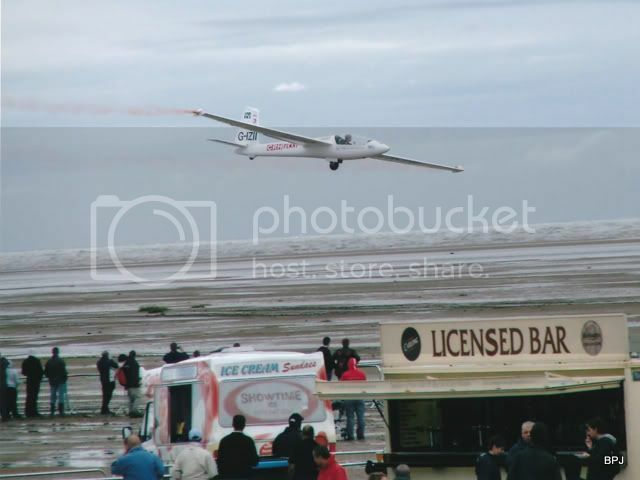 No Grob solo aircraft at Blackpool – but it could well have used Woodvale, if one participated! 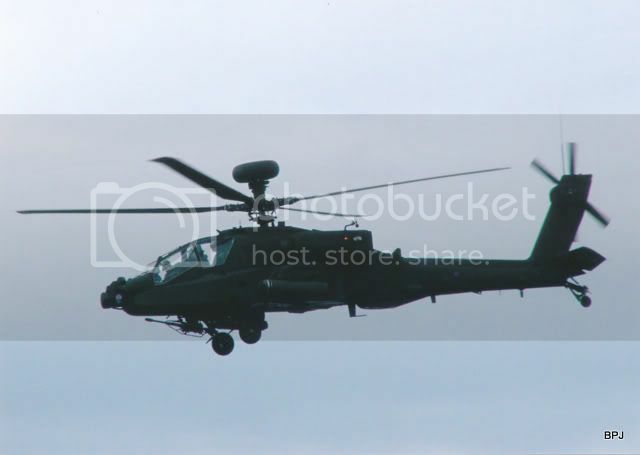 The 2006 photos were taken on a digital Fuji compact, with x16 optical zoom. However with the data lost, these are scanned from 7 x 5 prints, some rather tightly cropped! 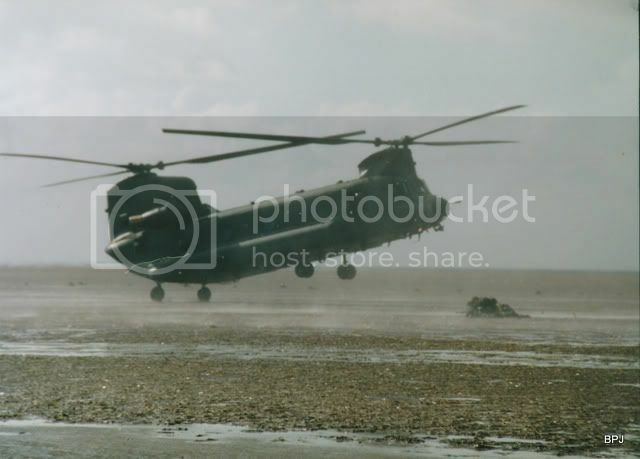 The soggy conditions in 2006 are illustrated by this 'sinking' Sea King. WEEKEND of 22nd & 23rd SEPTEMBER. The participants list was “lost” with the shut-down of the NWAN site on xsorbit. 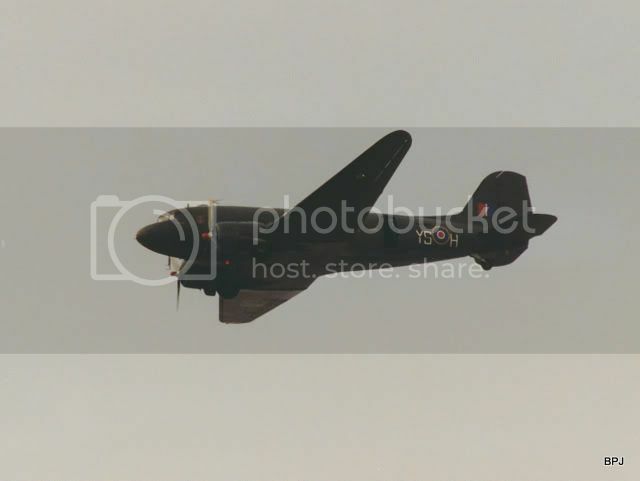 However, again John Wiseman and the Blackpool Aviation Society have provided me with detailed movements at Blackpool Airport to piece together the display listings. 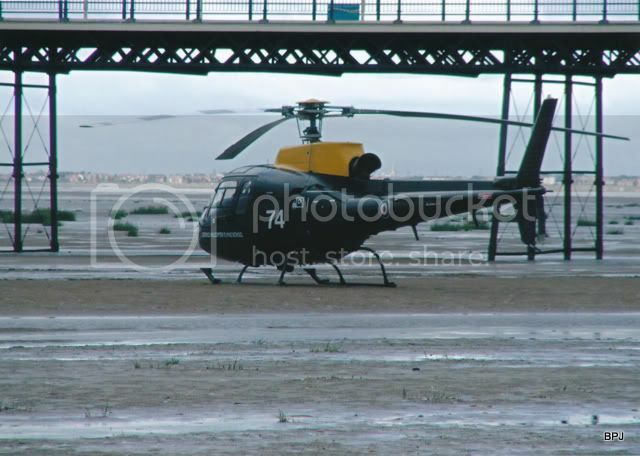 I cannot tell what landed on the beach, or if other aircraft/helicopters operated out of Woodvale. I do have a flyer with the dates and information that admission was £5 in advance, £7 on the day; with car parking £5 per car payable on the day only. 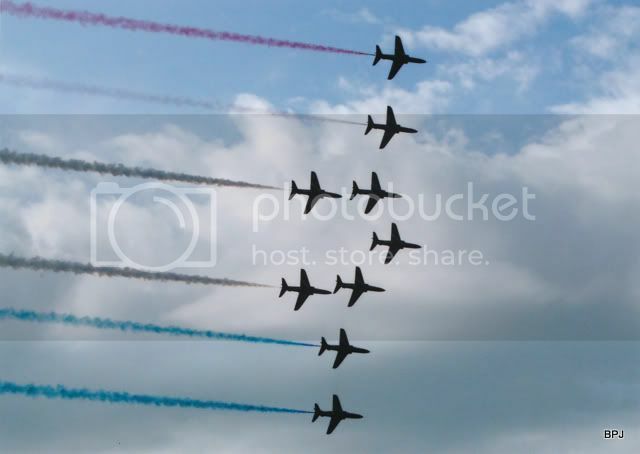 The ‘Red Arrows’, Typhoon, Hawk, BBMF, ‘Team Guinot’ wing walkers, ‘RAF Falcons’ free-fall team, ‘Blades’ team, ‘Black Cats’ and Chinook all promised in advance. Additional comment regarding participants on post #13 below. 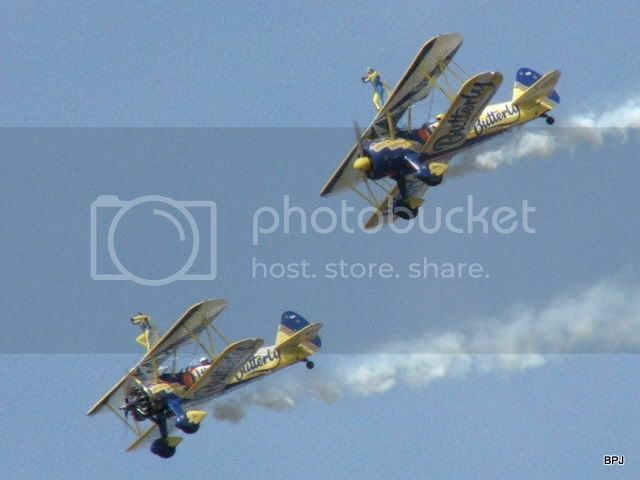 The question is did ‘Team Guinot’ with their Stearman operate out of RAF Woodvale or cancel? 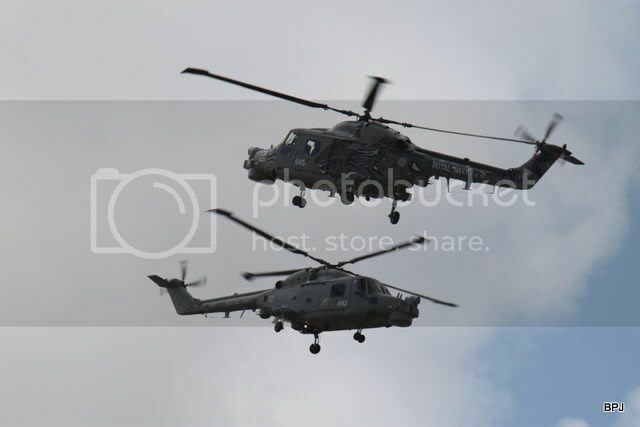 The RN ‘Blackcats’ Lynx pair, certainly appear to have used Woodvale as a base, ut did other aircraft too? 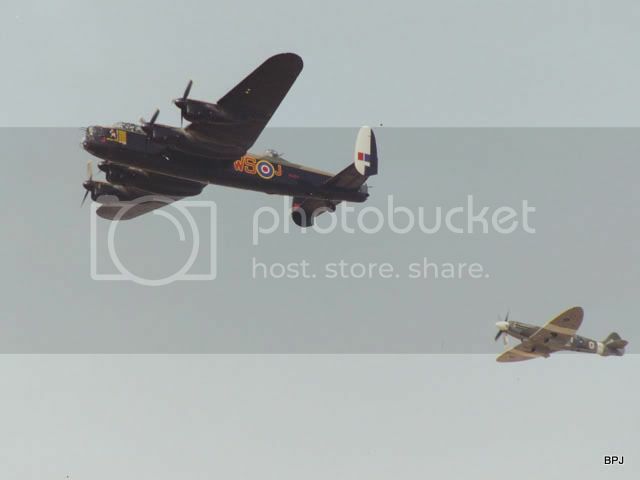 The BBMF and were billed to appear, and presumably did, but did not call at Blackpool Airport. Likewise the free-fall parachute team. Spares on ground at Blackpool: XX242 & XX292 (Saturday), XX294 & XX308 (Sunday) ‘Red Arrows’ Hawks, XX263 RAF Valley solo Hawk, ZF295 Tucano, ZJ918 Typhoon F.2. 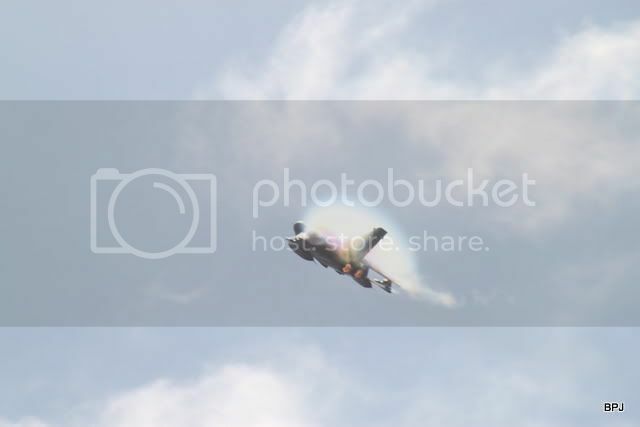 Same participants operating from Blackpool Airport, however, the solo Hawk, Typhoon and Tucano are not shown as operating on the Blackpool movements – did the weather do ‘duff’ towards the end of the display, so stopping the show early? Anyone able to illustrate 2007 displays? 2008 was the first year that Southport experienced ‘the Vulcan effect’ on visitor numbers. There were a number of changes. Liverpool John Lennon Airport became a major sponsor, so the RAF aircraft all operated out of LJLA. 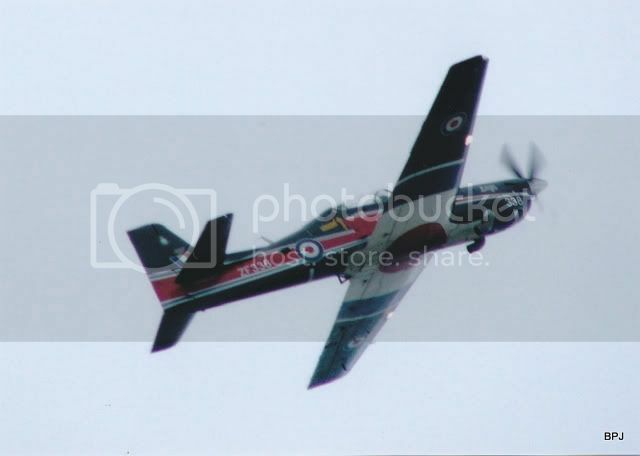 The RAF had changed the way they allocated display aircraft to air displays, allocating just a few air shows ‘role demonstration’ status and extra aircraft, and provided quite a major spectacle. 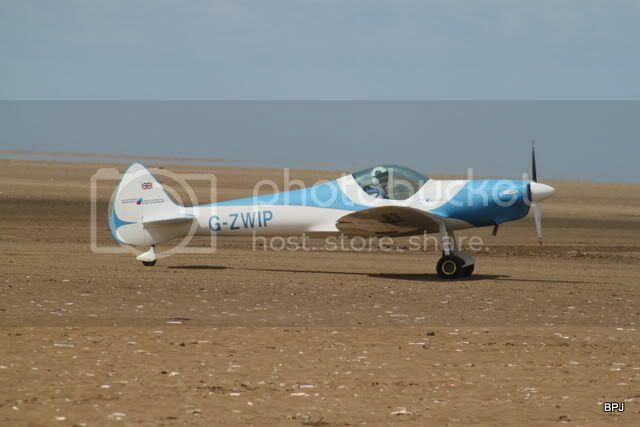 Also the beach airstrip was again available for fixed wing aircraft (last available 1996). I have my list for the SATURDAY, the programme (£4) and digital images to help cobble a near complete list together. Once again, the original NWAN BB listing was lost with the shut-down of the xsorbit site, however this list I consider fairly complete and accurate. Conditions were not ideal with a cold gusty wind and soggy, wet sand underfoot. The Vulcan was billed to appear on the Saturday, but due to en route weather was postponed, displaying towards the end of Sunday afternoon’s show. 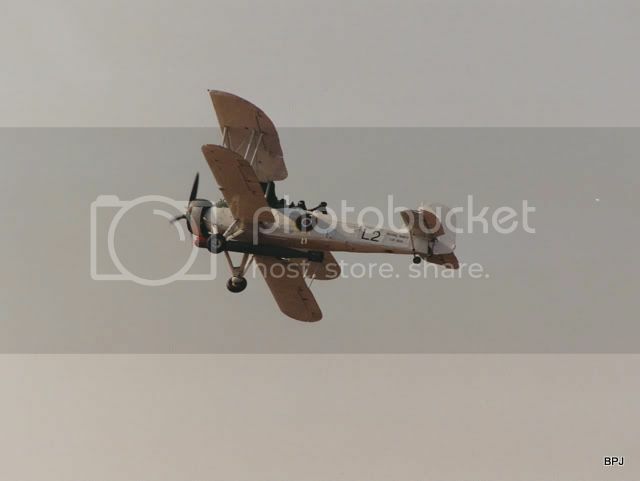 Apparently a Vagabond, Fox Moth (canx) and several microlights were expected to land on the beach, may have done so on the Sunday, certainly they were not there on the Saturday. Indeed there were less aircraft on the beach than usual! 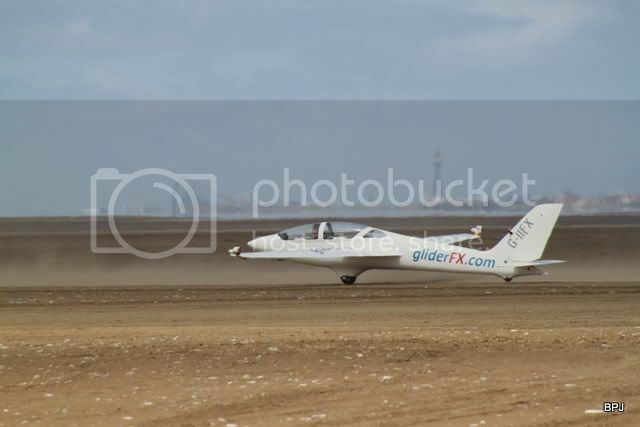 The ‘Twister’ team used the beach both days though to recover their glider. Given the current air show ‘scene’, the lack of any ‘historics’ in 2008 was much commented on, although largely due to the weather elsewhere. Despite the weather and conditions underfoot, certainly one of the better Southport Air Shows I’ve attended, despite a number of ‘no show’ gaps and the cold; with dramatic flying from a glider and Twister all the way up to multiple Tornados and a Sentry, by way of impressively flown Apache and Chinook helicopters. 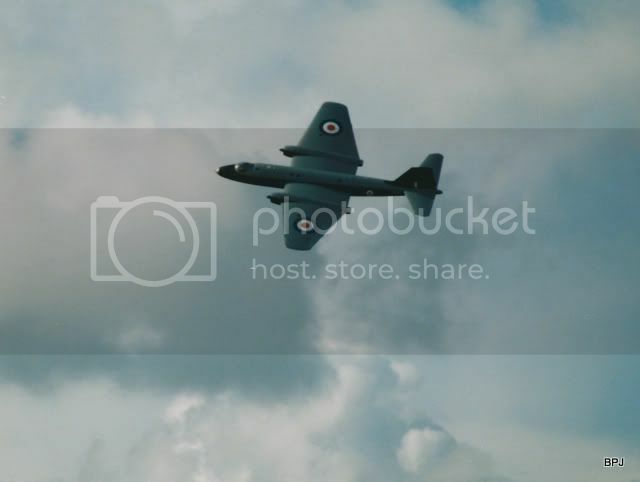 XE584 Hawker Hunter F.6 nose only in ‘Heritage’ Tent, all black. 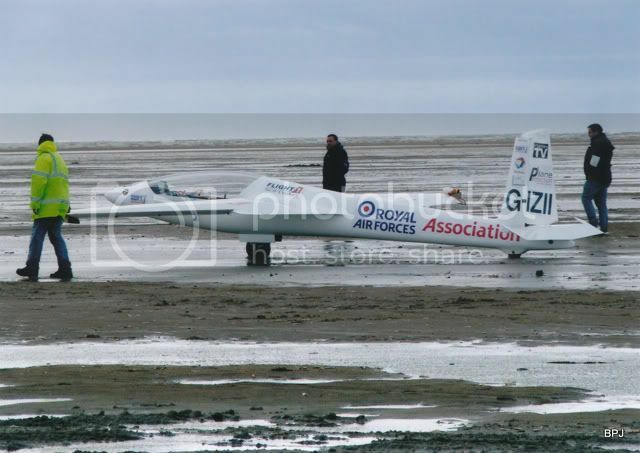 ZJ274/74 Squirrel HT.2 DHFS, with ‘Red 10’ to commentate, landed on beach. 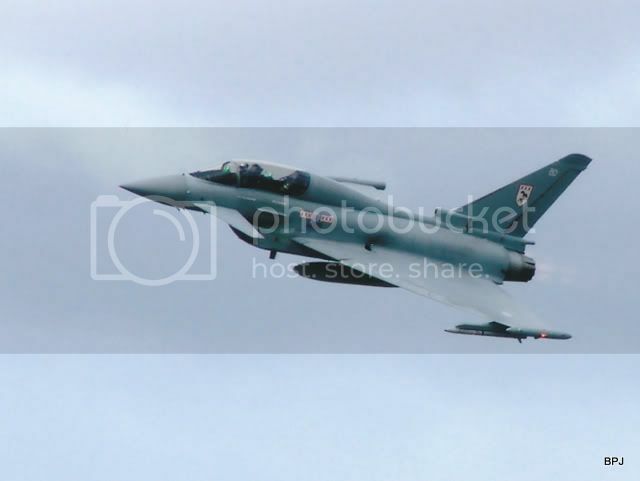 The ‘spare’ aircraft at Liverpool Airport: ZJ803/BA Typhoon T.1 29 Sqdn, ZD851/112 Tornado GR.4 no unit colours, XX220 Hawk T.1 solo, ZE941/KT Tornado F.3 43 Sqdn – went tech on arrival, so became the ‘spare’ by default, ZE810/GG Tornado F.3 43 Sqdn aborted take-off on Sat, participated Sunday. 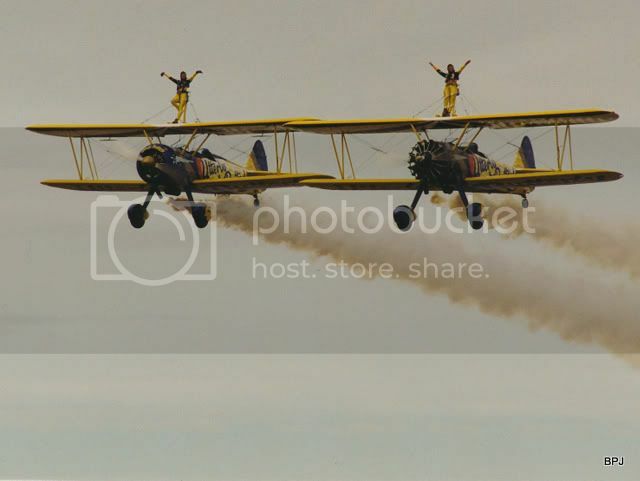 ‘No shows’ on the Saturday were the Great War Team, Stearman wing-walking, and the BBMF. Don’t know if any of these ‘missing’ aircraft made it for the Sunday show. The line-up for the 2 days was the same, with the exception being the addition of Vulcan B.2 XH558 on the Sunday. 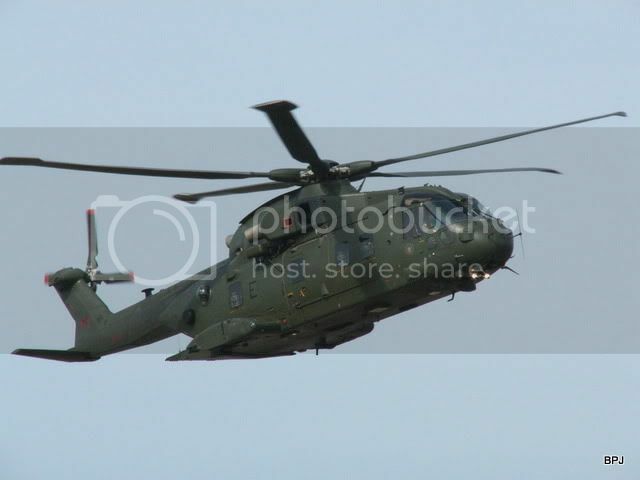 All the helicopters were at RAF Woodvale on Saturday morning as I passed on the train: 2 x Navy Lynx (regn of 2nd one unknown), Army Lynx, Apache, Chinook & the Grob Tutor, together with the Police EC.135 (which did not overfly the beach this year). 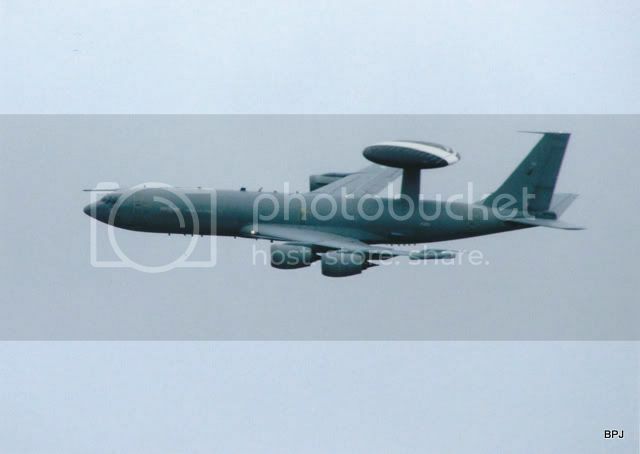 The Sentry operated from Waddington, the other RAF aircraft (Hawks, Tucano, King Air, Typhoon, Tornados from LJLA, while the “Red Arrows” used Blackpool. 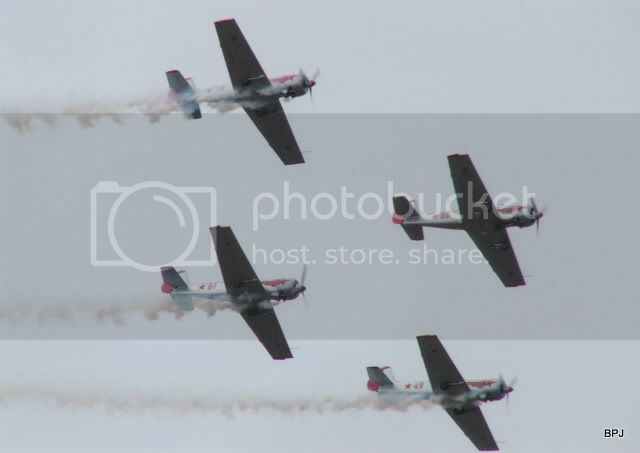 The “Blades” appeared to use Blackpool. Digital images, but scanned from 7 x 5 prints, as the original data now lost. Camera a Fuji compact with x16 optical zoom. WEEKEND of 26th & 27th SEPTEMBER. 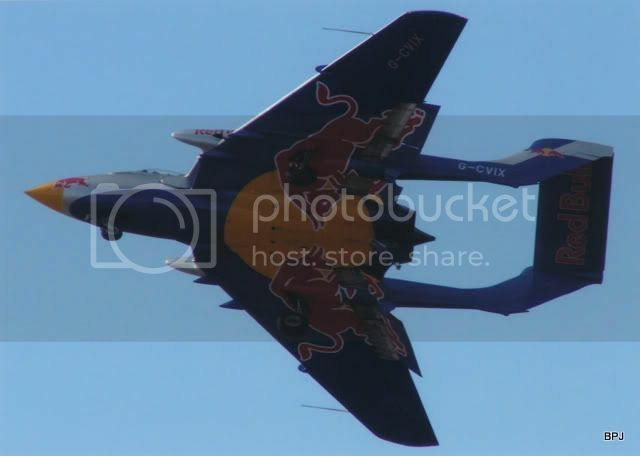 The 2009 show, right at the end of September was the latest date that the Air Show has ever been held. While cool it was not a bad weekend weather-wise. After the spectacle of the Armed Forces ‘Role Demonstration’ the previous year, and with no Tornado F.3, Tornado GR.4, Apache or Harriers on offer from the MoD, 2009’s show was a very different affair. 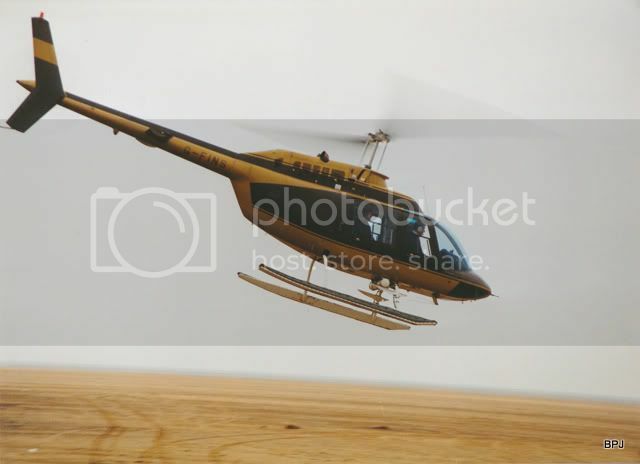 Even a number of helicopter types expected were axed at relatively short notice. The Pawnee/Swift/Twister combine were once again amazingly impressive and quite breath-taking to watch. 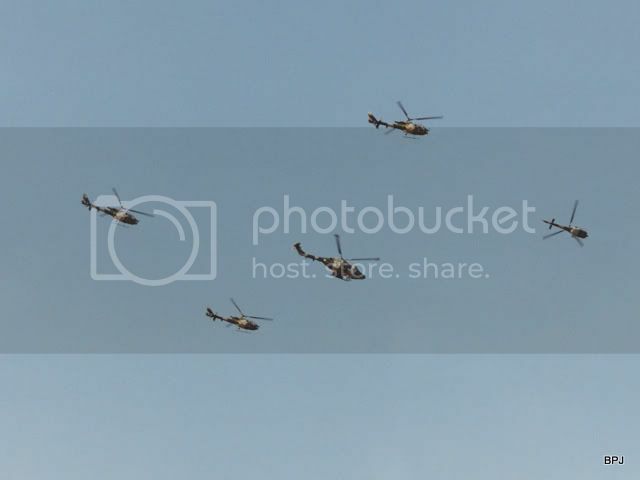 The Seafire and Sea Hawk formation provided an unusual photo op for the regular airshow attender. 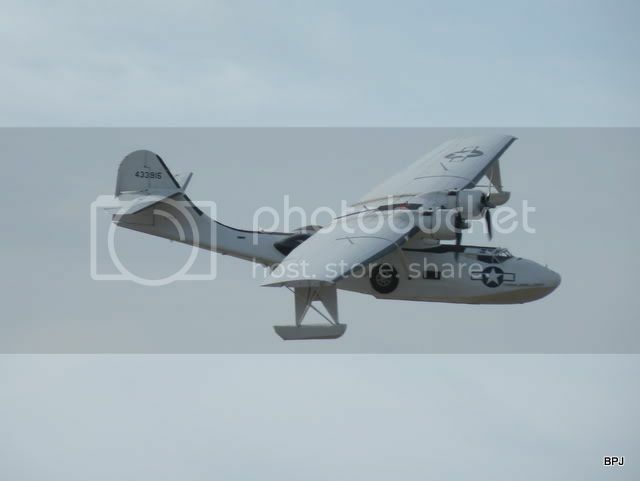 The Catalina, once again impressed with its slow speed and size, while the RAF Falcons unusually jumped out of the Cark based Fletcher Fu-24, regretably it did not make a low pass along the flight-line. 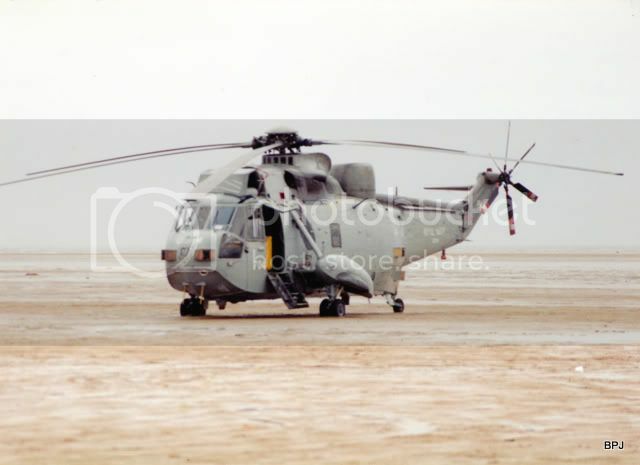 Cancelled items: Sea King HC.4, Sea King HAR.3 (Sat), Puma (beach static), RAF Merlin and Chinook. 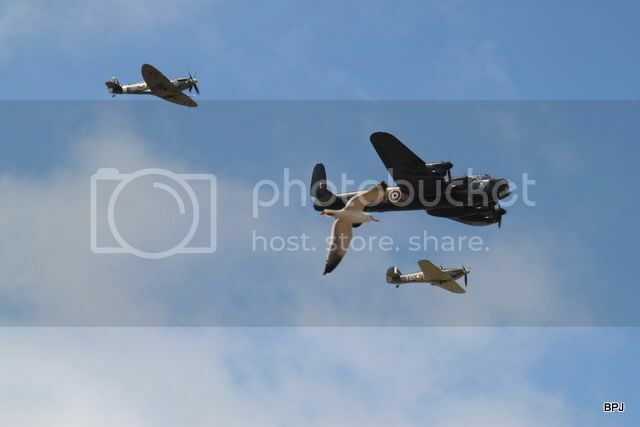 The BBMF appeared on Saturday only, the Seafire and Vulcan on Sunday only. It would appear that again the beach was little used – I recall only the Pawnee and Swift glider and the two Squirrel HT.1s landing. Although I was there on the SUNDAY, log covers both days, but does not include static display aircraft in the ‘Exhibition Village’. Operating from Liverpool: Typhoon, Hawk, King Air 200, Sea Hawk, Catalina. ‘Spares’ at Liverpool: XX195/195 208 Sqdn & XX245 special cols Hawk T.1 and ZJ809/BH Typhoon T.3. The Vulcan operated from Brize Norton. These are digital images, posted here without refinement. For 2010 I decided to split the weekend, LJLA on the Saturday, Woodvale on the Sunday. However events, or more correctly the weather, overtook my plans. Due to the heavy rainfall overnight, with a poor forecast for the Sunday, with a potential to flood, and fresh memories of the problems caused by heavy rain (2006 or 2007 I think), early on the Sunday morning the organisers took the bold decision to cancel the event for the whole day. While this disrupted the plans of many, including myself, it may have been a wise decision, although the Sunday afternoon showers were not that heavy (at least not in South Liverpool), conditions would not have been far from pleasant for spectators or pilots. 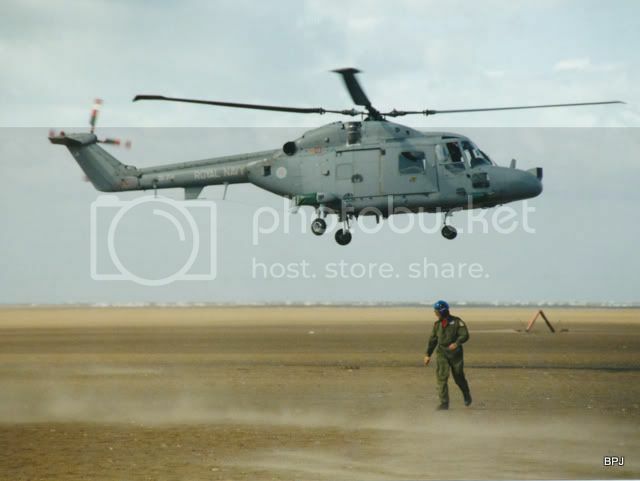 Plus plenty of LJLA photos on the dated threads for Friday 17th (=4249) and Saturday 18th (=4259). 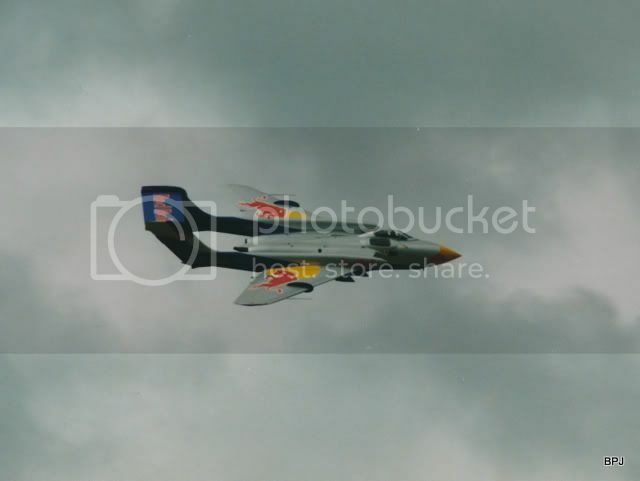 Clearly photographic highlights were the mixed formation of de Havilland types, all with local connections, the pairs of Venom, Gnat, Tornado and the non-BBMF WWII fighter duo. 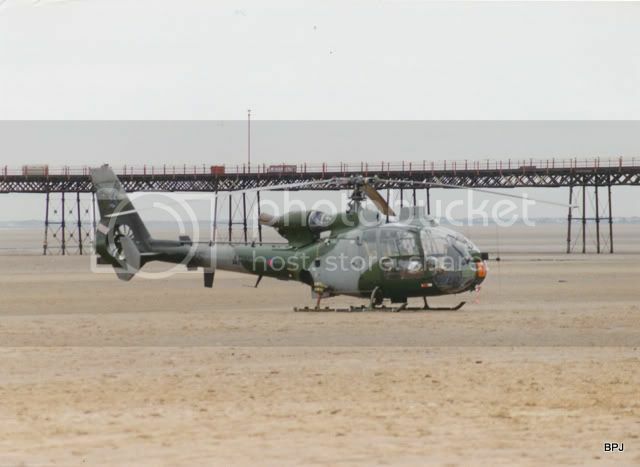 ZJ256/56 & ZJ275/75 Squirrel HT.1 DHFS both used the beach, communications with Blackpool. ‘No shows’, principally the Typhoon FGA.4 solo, due to a ‘fleet-wide’ grounding for inspection. 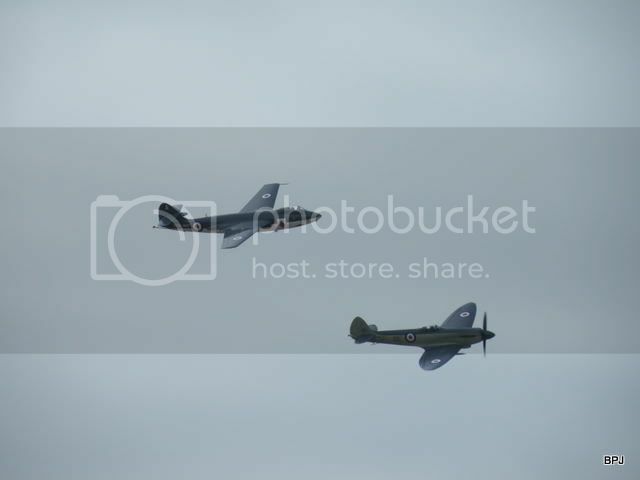 The BBMF Spitfire and Hurricane were unable to appear so were not programmed, while an addition to the programme was the AAC HF Beaver and Auster. Woodvale based were the ‘Swift’ team, Tutor, Spitfire & Hurricane, Catalina, ‘The Blades’, ‘Wildcats’ and both Merlins. 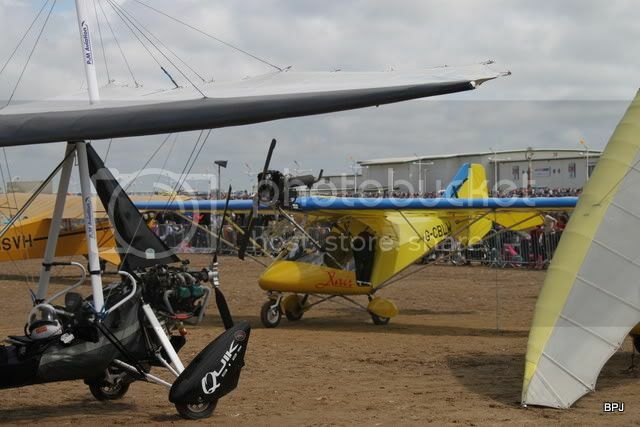 Also there in connection with the Air Show, but thought not to have participated: G-AOIR Thruxton Jackeroo and G-PRAG a Colibri MB.2 (but reported as a Pitts!) in “RAF Benevolent Fund” sponsor titles. 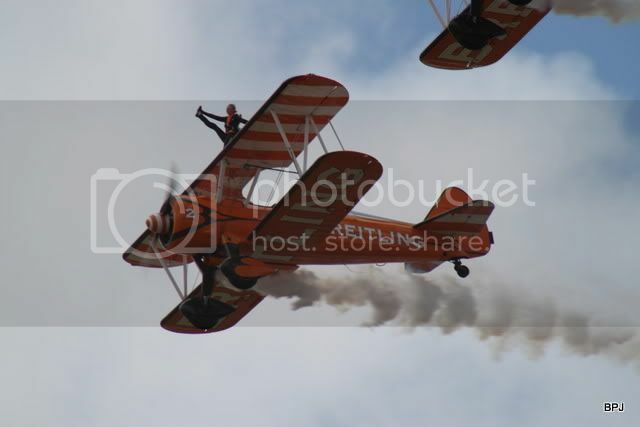 Woodvale hosted a Battle of Britain fund raising event on the Friday evening. Additional to the aircraft gathered there for the Saturday, BBMF Spitfire PS915 displayed, but did not stop. 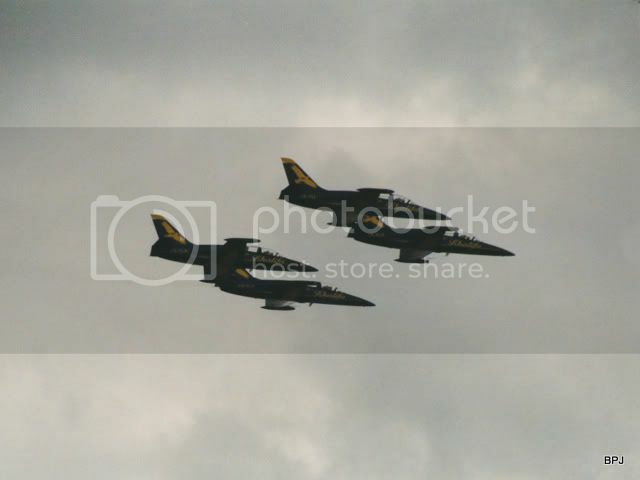 LJLA based: the Tornados, Hawk, Tucano, both Gnats, both Venoms, Hunter. 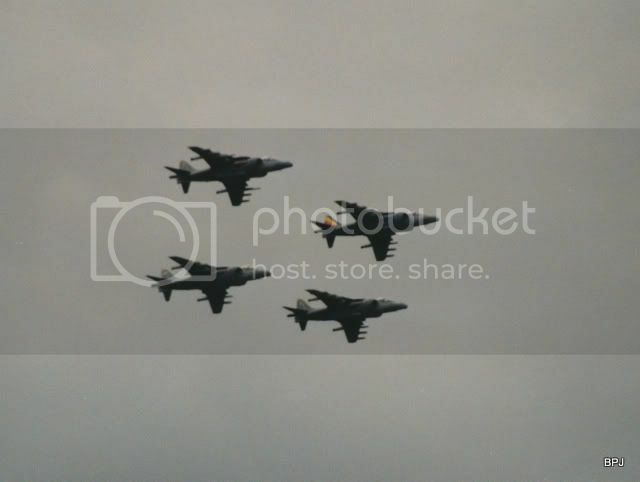 ‘Spare’ aircraft: Tornado ZA549/041 15 Sqdn, ZF169/169 Tucano 72 Sqdn & XX220/220 Hawk 208 Sqdn. Blackpool based: The ‘Red Arrows’. 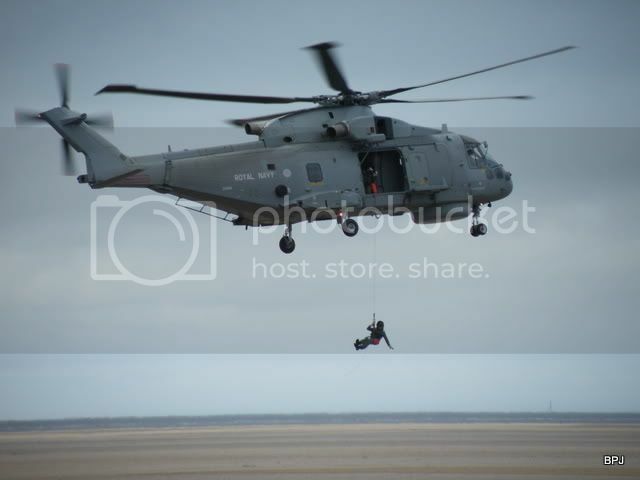 The Sea King operated from RAF Valley. 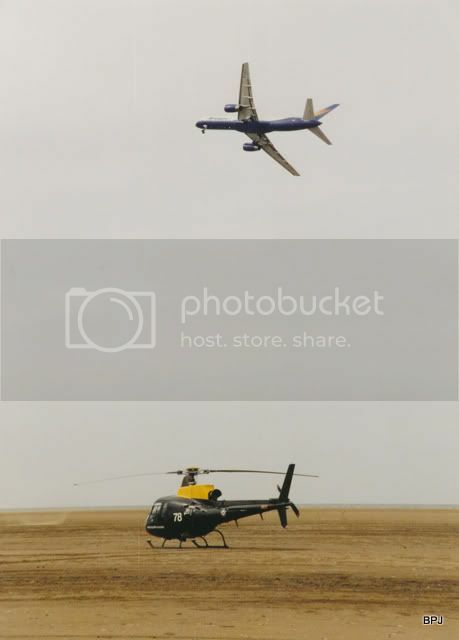 Questions: Did the parachute team use the reported Cessna 182P G-BMUD out of Woodvale, or the anticipated Cessna 206 out of Blackpool, if they jumped at all? 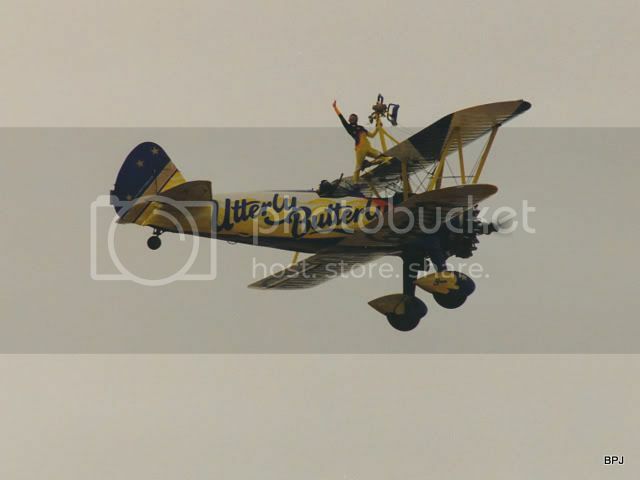 Did the Army HF Auster display alongside the Beaver, or was the Beaver a solo display? 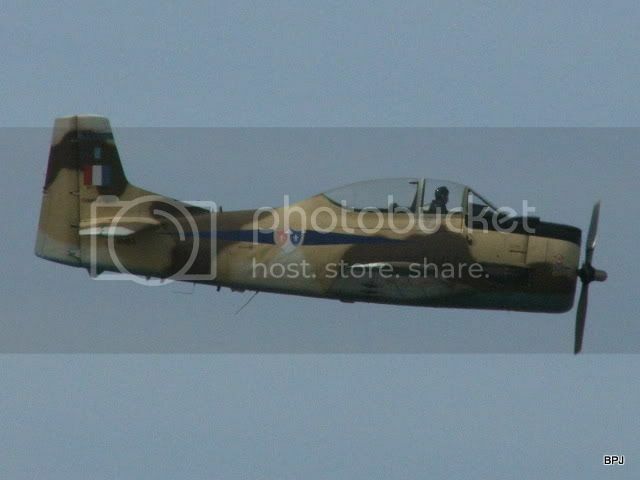 I don’t have absolute confirmation that the ‘Blades’ used the aircraft listed, although 99% certain. WEEKEND of 23rd & 24th JULY. The earliest ever weekend for a Southport Air Show. I for one enjoyed the sunshine, without a need to be well insulated! Certainly the organisers had no need to resort to drastic weather based decisions in 2011. At last, after several years of expectations, a static park on the beach comprising aircraft that had flown in for the day. 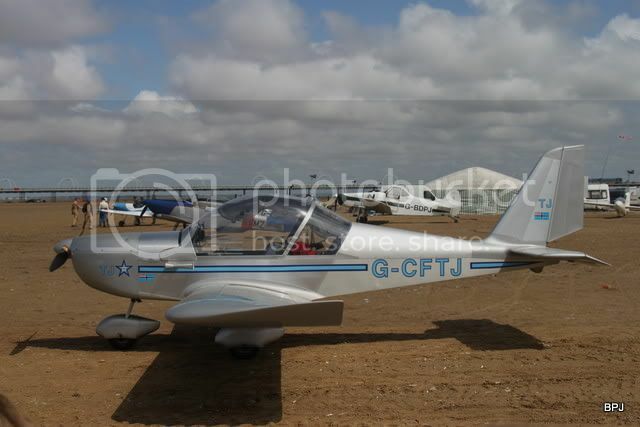 No report for the Saturday was ever posted, but I gather there were light aircraft visiting then too. A good show, with a varied line-up. 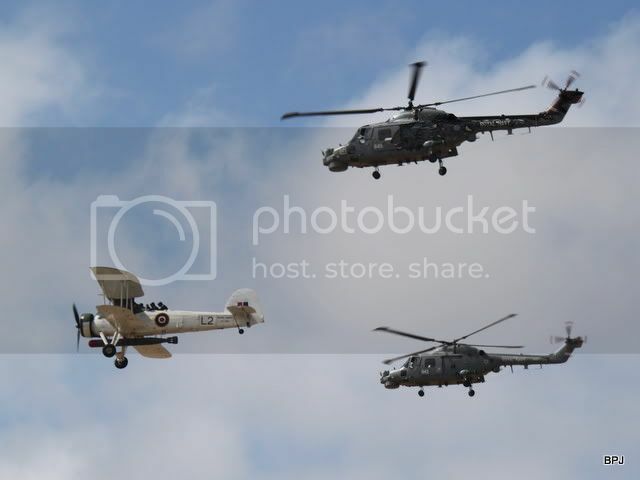 The combination of the Swordfish in formation with the Lynx pair, provided a great photo opportunity. The noise and fast passes of the Tornados in the finale ‘attack’ sequence provided needed spectacle. Liverpool John Lennon Airport were major sponsors for the 4th consecutive year. The Air Show programme (£3) showed that there was little difference to the display line up on the two days, although the sequence was much different. 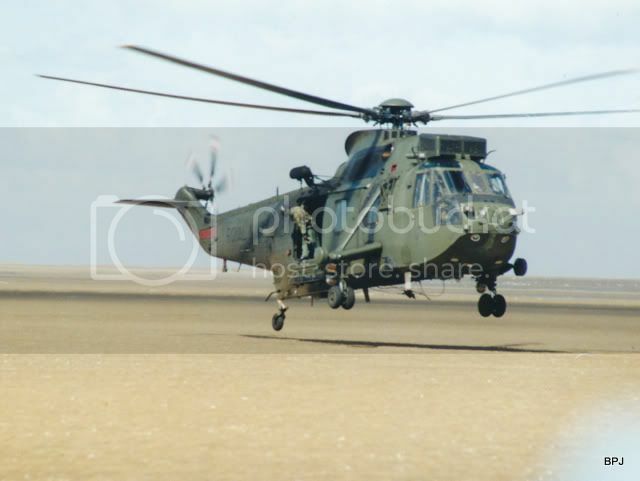 Main changes being that, for SATURDAY only was a RAF Valley Sea King HAR.3 and XH558 Vulcan B.2 VTS. 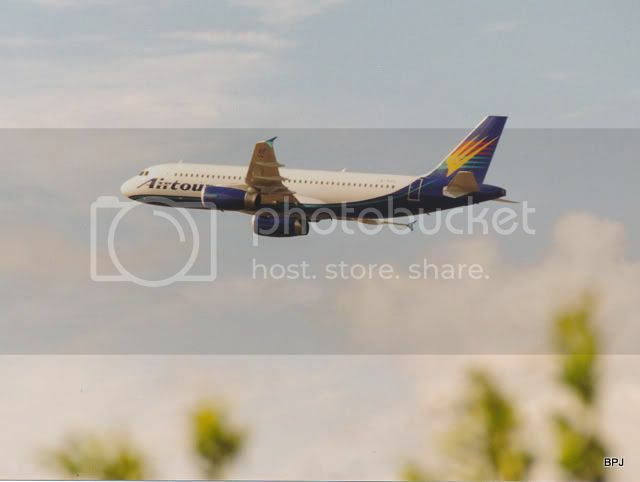 There were presumably differences to the visiting aircraft in the beach ‘static’ park. This log is for the SUNDAY. 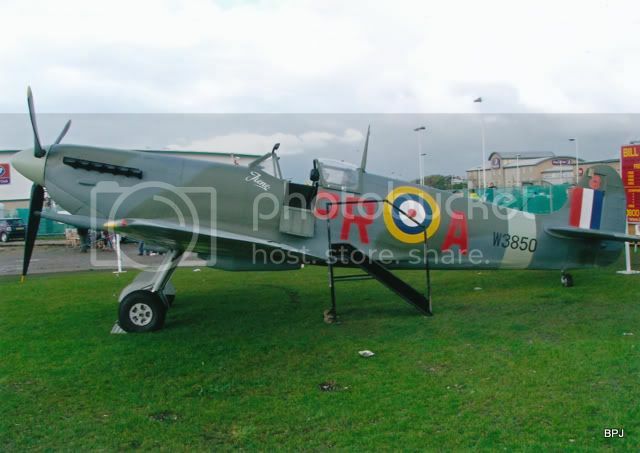 "BS435"/F-FY Spitfire 9, full scale metal replica, very realistic. G-IIFX MDM-1 Fox sailplane, "GliderFX.com"
G-HILZ & G-RVMZ Van's RV-8 'RV8tors Team' "Fly2Help"
G-SWIP & G-ZWIP Wells Silencer Twister, 'SWIP Team', "Scottish Widows"
(G-PSST) Hunter F.58A, "Miss Demeanour"
472035 (G-SIJJ) NA P-51D Mustang, "Jumpin'-Jacques", Hangar 11. PA474/BQ-B & HW-R Avro Lancaster B.1, BBMF "Phantom of the Ruhr"
LS326/L2 Fairey Swordfish, RNHF "City of Liverpool"
The only 'no show' was Hangar 11's P-40 Kittyhawk, which had been replaced by their Spitfire PR.9 after the programme printed. 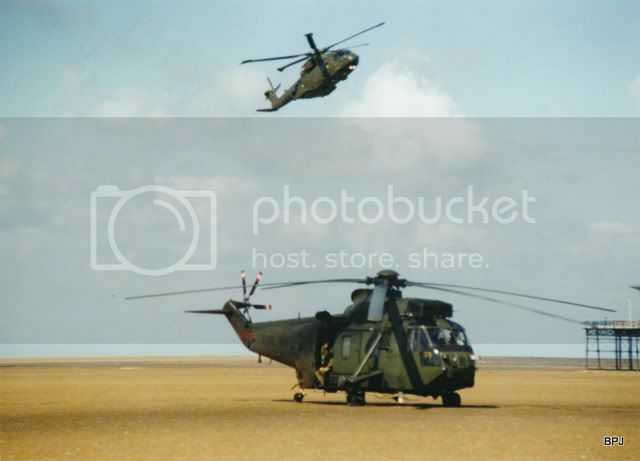 Parachutists, the "Tiger FFT" formed by the Royal Artillery, unusually jumped from the two RN Lynx. Most of the light aircraft eg Blades, SBach, Swordfish, Spitfire, Hurricane, Black Cats, Breitling, SWIP Team etc used Woodvale. The ‘Red Arrows’ used Blackpool, as I suspect did the BBMF. In patchy sunshine for much of the afternoon, and a constant cooling stiff on-shore breeze provided a recipe for lots of rather red faces by the end of the afternoon. Quite a change to need sun block not gloves and hat! An entertaining display. Some slight gaps, but that is in the nature of a beachfront air display. Nice to see three participant duos actually operating off the beach. 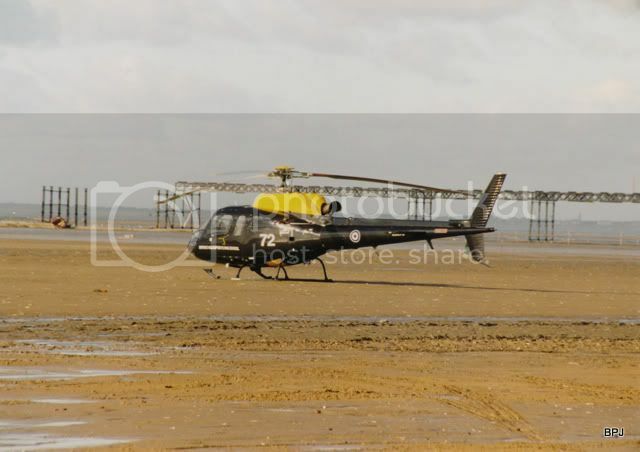 Also good to see a small collection of aircraft that had landed onto the beach during the morning. Apart from some great flying, the only innovative item was a formation formed by the two Lynx led by the Swordfish. 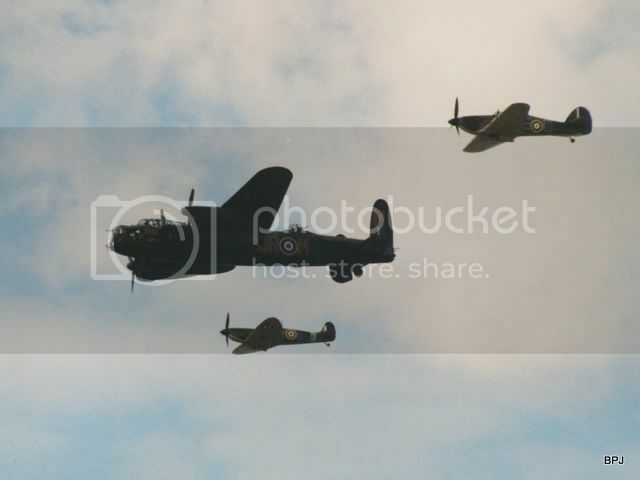 The BBMF seemed to have refined their display since I last properly watched them a year or so ago, with the Spitfire and Hurricane flying together before solo slots. The 'Alien' Tornado GR.4 pair at the end were terrific, don't think I've seen a Tornado demonstration with so many wings swept-back fast passes before. A great spectacle, an increasing difficult feature for display organisers to find. With serious traffic jams developing after the display on the Saturday, the Sunday programme was brought forward, the first item being the Spitfire PR.9 at 1210 (40 minutes early), the last item, the Tornados 1630-1638 (again 40 minutes early), the sequence of the programme was considerably different to that published. The PA system on beach and prom was loud and clear without echo, but a real problem when trying to take an urgent mobile phone message! I really enjoyed the afternoon, well done to the organising team. Apparently it is back to September in 2012, I for one regret that, as I enjoyed not getting freezing cold and wet in 2011! Indeed it is back to September for 2012, weekend of the 8th and 9th, to be precise. This will be a difficult year for the organising team, with a clamp on local authority tourism funding, funding limitations on RAF display appearances and companies examining closely any proposal for sponsorship deals. 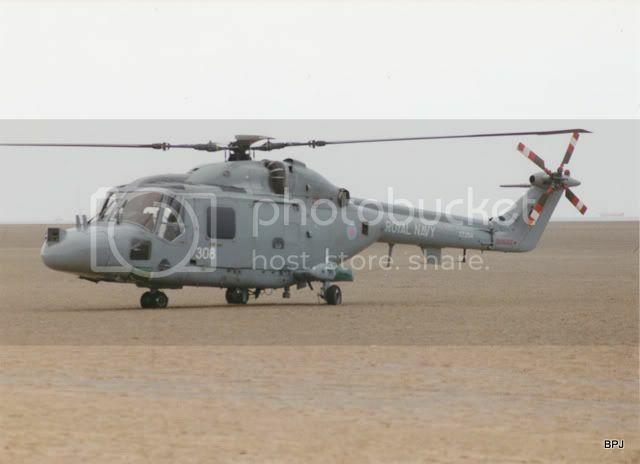 It will be interesting to see what the line-up for 2012 will produce and what part LJLA will play this year. 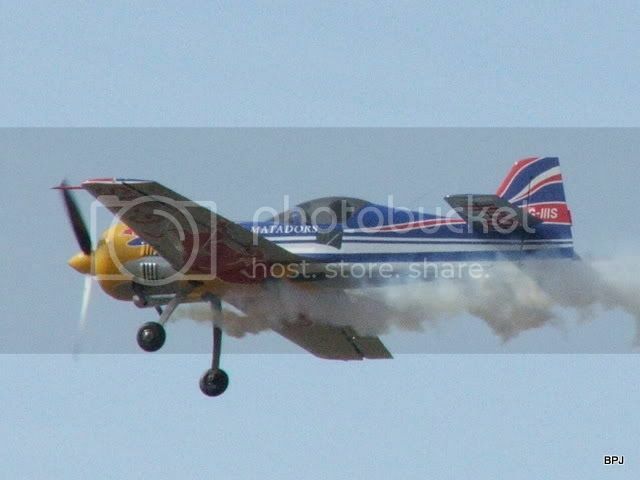 I’m amazed at how much detail I’ve been able to dig out for this review of the Southport Air Show. It was my intention to have this ready for the 20th anniversary, well, I’m a little late (or am I a little early for the 21st anniversary) but that doesn’t matter! I reckon that I’ve attended 13 of the 20, at times frozen and wet, just occasionally warm and comfortable. 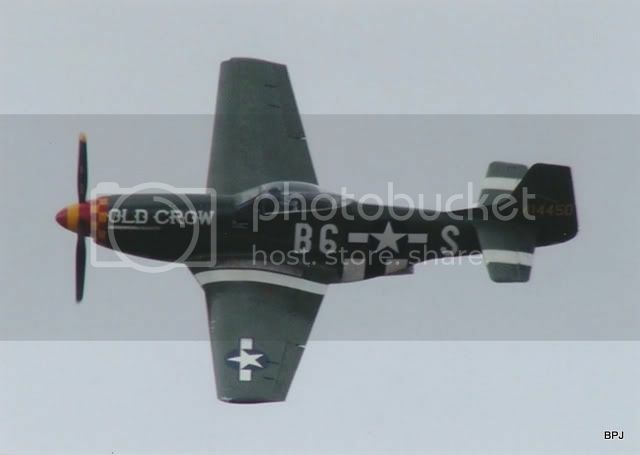 There can be no doubt that the show has improved as it has grown over the years and become a permanent fixture on the air display calendar. It is also remarkable how many seaside resorts have followed Southport’s pioneering lead. I really would like to be able to complete detail logs for 2004, 2006 & 2007. Amendments, additions and comments for any other years would be welcome too, either by PM or a posting on the thread. In addition to the weather cancelled Sunday in 2010, I have memories other badly weather hit days, certainly the weekend of 2004 and in 2006 Saturday’s flying was severely affected by cloud and rain, but where there other days too? Which year were pedestrians first charged for entering the promenade area, so ending the era of the Air Show as a ‘free’ event? Trust you enjoy this factual and illustrated walk down memory lane and, please, do feel free to add your own memories and photographs. As always Brian, superb report. Thanks to a great deal of assistance from John Wiseman and the Blackpool Aviation Society, I have been able to re-construct decent logs of participants for the 2006 and 2007 displays, that I had previously been missing. Post reply #6 has been amended with the new information. Still seeking complete logs for 2004, 2006 and 2007 though. 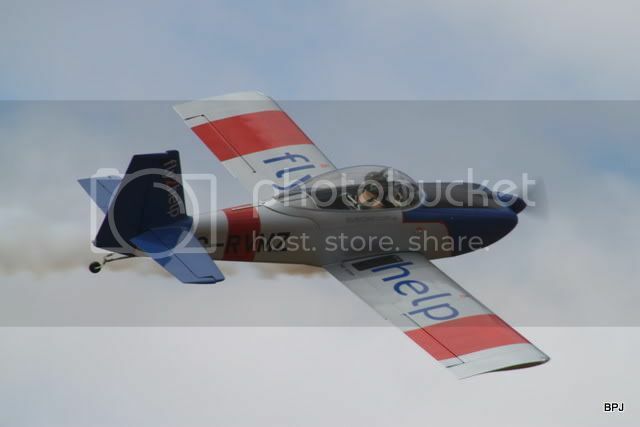 This is an unusual thread in that no one, as yet, has added their photographs taken at any of the Southport Air Shows. In particular, I would love to see the shows for 1991, 1992, 1993, 1994, 1995, 1998, 2004 and 2007 illustrated, although any of the years pre '08 would be welcome. 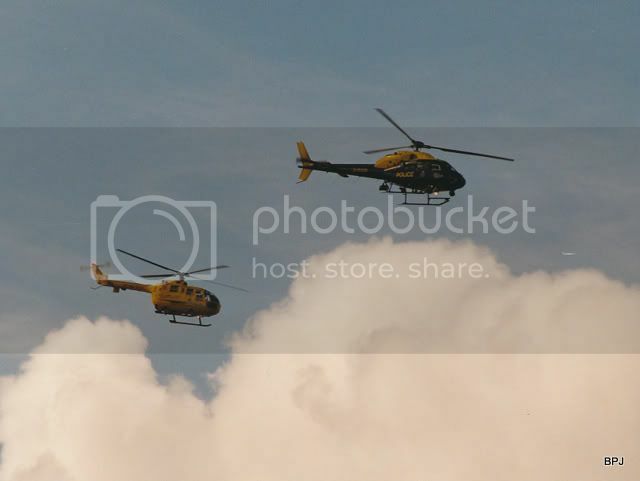 Were you there with a camera? 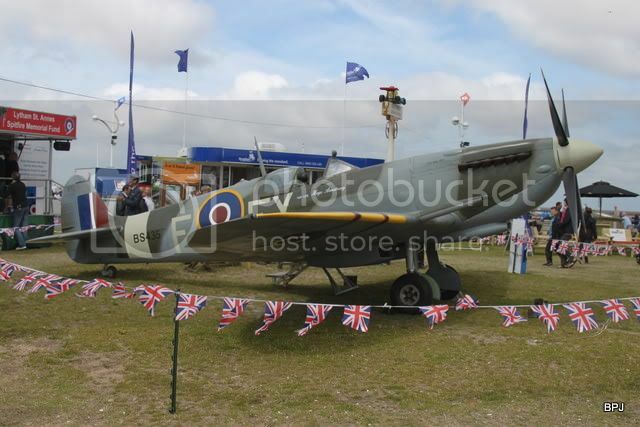 One aircraft not mentioned that appeared both days I think at the 2007 airshow, was Spitfire IXT PT462, it definately appeared on the saturday as i was there, replacing the merlin helo which went tech. 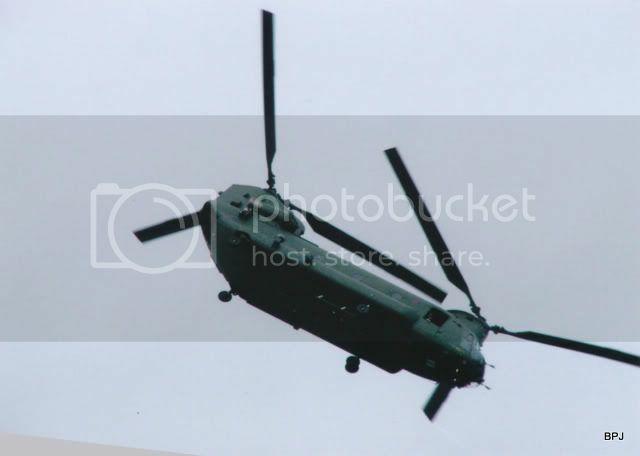 Also the falcons dropped from a chinook on the saturday. 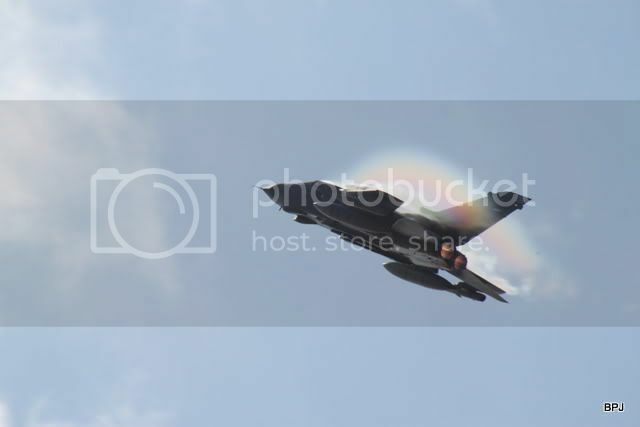 Eurofighter appeared on saturday and I think Sunday. 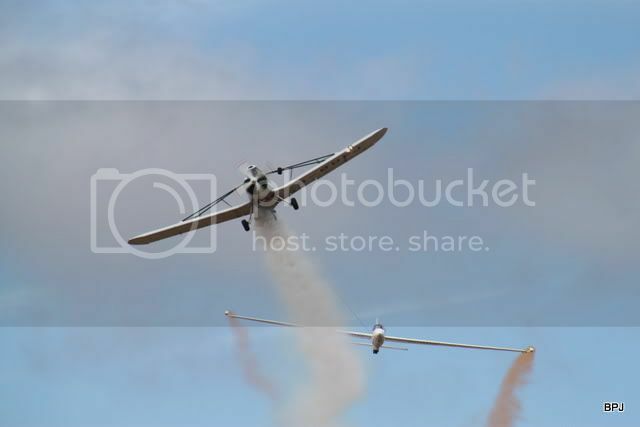 Team guinot "wingwalkers" appeared on the Sunday only with solo Stearman. 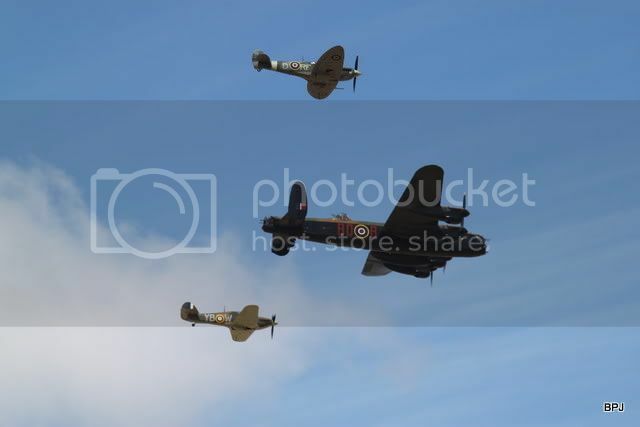 The BBMF definately appeared on the Saturday with Hurricane IIC LF363 and Spitfire XIX PM631. 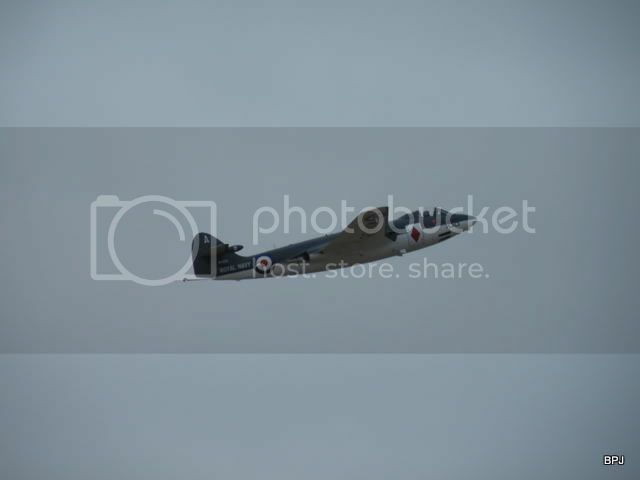 The Dakota went tech at Coningsby so didnt appear, i'm not sure if they attended on the Sunday. 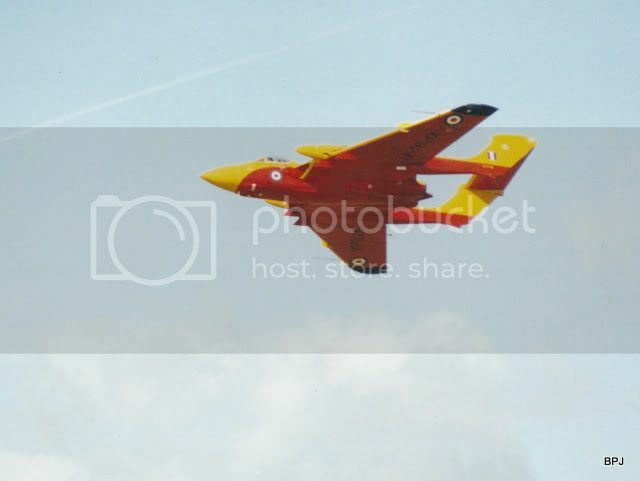 A26 Invader appeared on the Sunday only due to nose wheel shimmy on the takeoff run at Blackpool on saturday. Not sure what else appeared on the sunday. Hopefully someone can else can help out. Eddiewinch82, Thank you for taking the time to fill-in some of the 'holes' in the 2007 report. Your input is much appreciated.